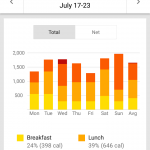 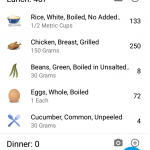 Finding the best calorie counter app to track your daily intake of food can be daunting. 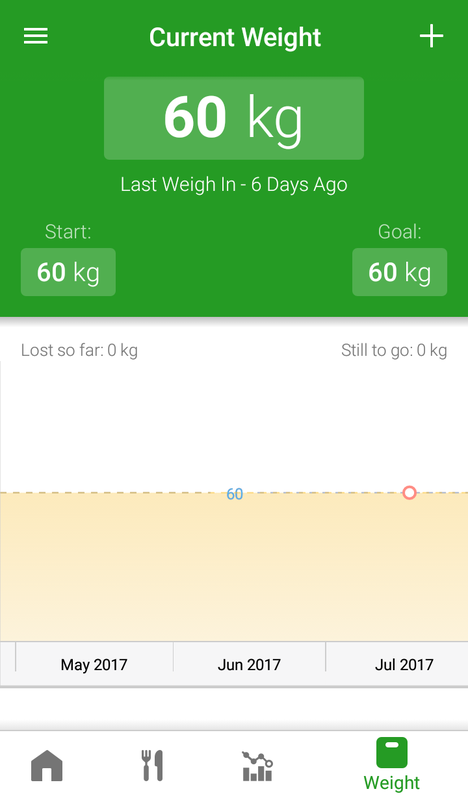 Short of time? 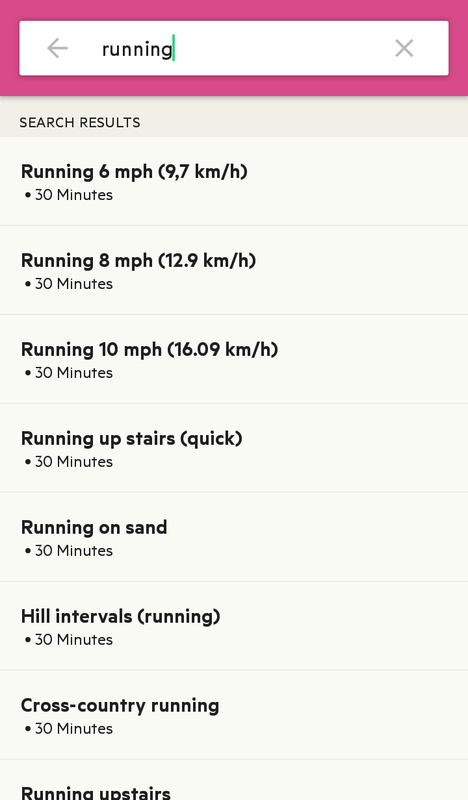 You can skip directly to the results, where I have aggregated everything into a nice and easy-to-compare side-by-side table at the end of this page. 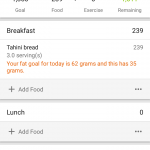 Keep reading in case you want to find my detailed reviews of the following apps: FatSecret, Lifesum, Lose It!, and MyFitnessPal. 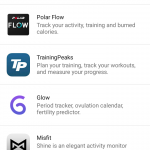 The selection criteria for the apps I put to test were basically being the most popular options available on both iPhone (iOS) and Android platforms AND apps that were free or, at least, freemium. 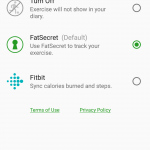 FatSecret is a 100% free app, which means all features are available at all times without in-app purchases. 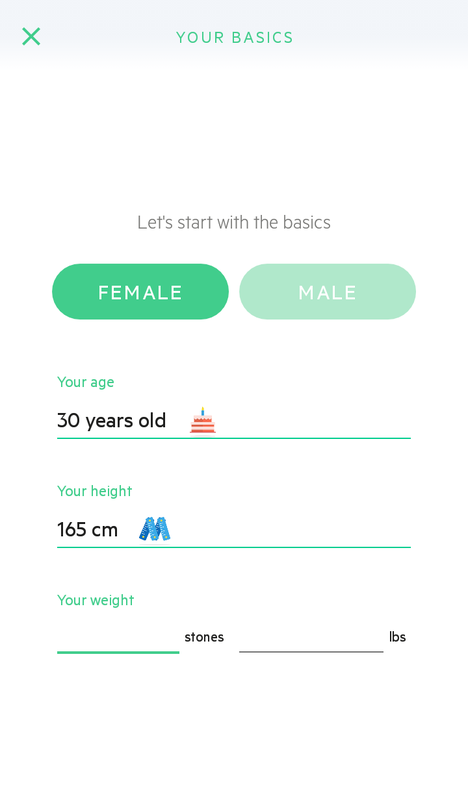 Starting the app for the first time triggers the onboarding and set up flow, where you can quickly create your profile, providing basic information like your height, weight, and diet/lifestyle goal. 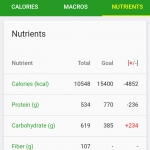 Depending on the diet plan you are following, you might have a goal as simple a setting up a maximum calorie intake per day, but you might also have something more complex where you define your intake of macronutrients such as carbs, fat, and protein. FatSecret allows you to define a percentage of these macronutrients, which means your daily and weekly reports will use these values as the reference for the results. 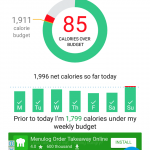 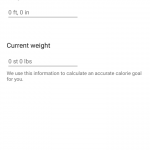 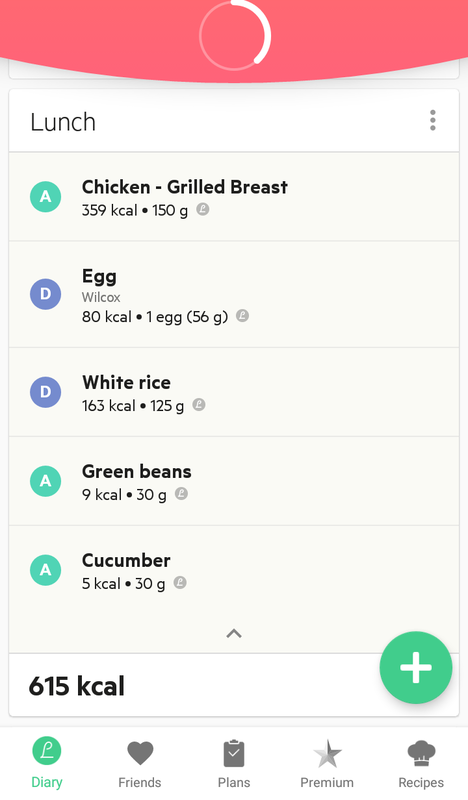 Now to the meat and potatoes of this kind of app, we have the daily tracker of calories. 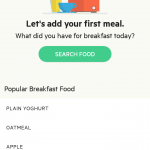 As such, FatSecret allows you to log any food eaten into 4 different sections: Breakfast, Lunch, Dinner, and Snacks/Other. 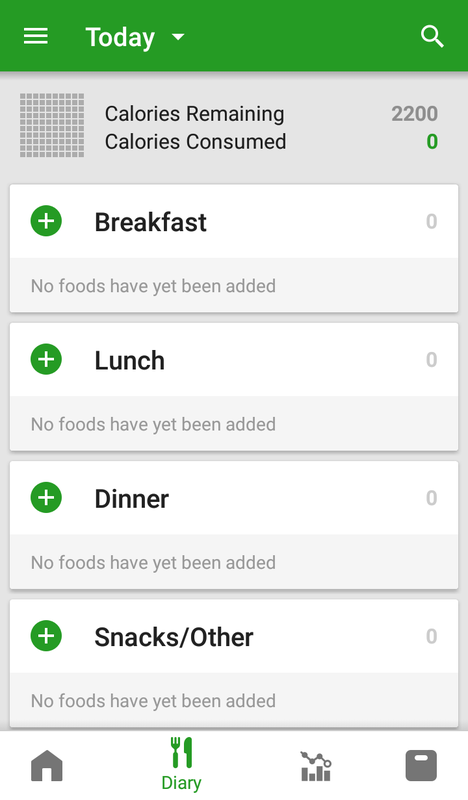 The interface is nicely organised, making the task of adding a single item, or even multiple items, a breeze. 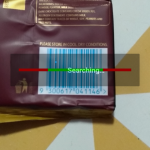 You will normally use a textual search to find the items you want to log; search results tend to be accurate, but sometimes searching for a particular food type without specifying a brand, might bring a bunch of branded results first (which I could assume are commonly picked by other users), but I would expect to see generic items first then branded ones. 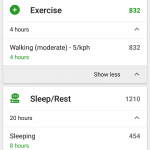 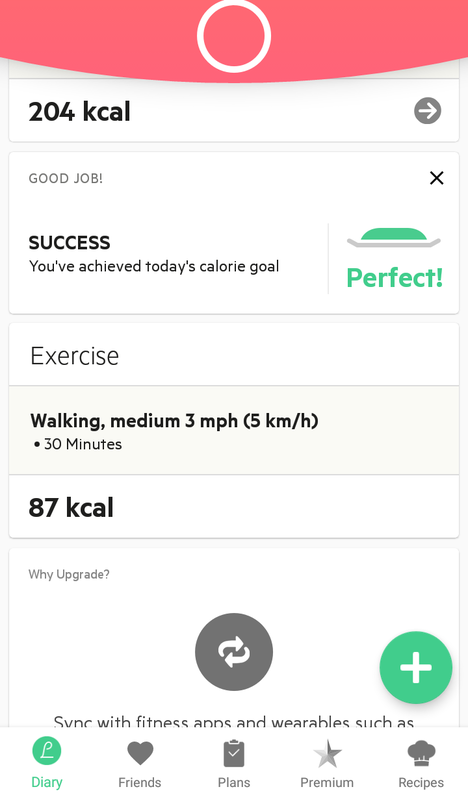 The app also allows you to track physical activities (exercises) you have done throughout the day; which is a nice way to obtain more accurate results by the end of the day. 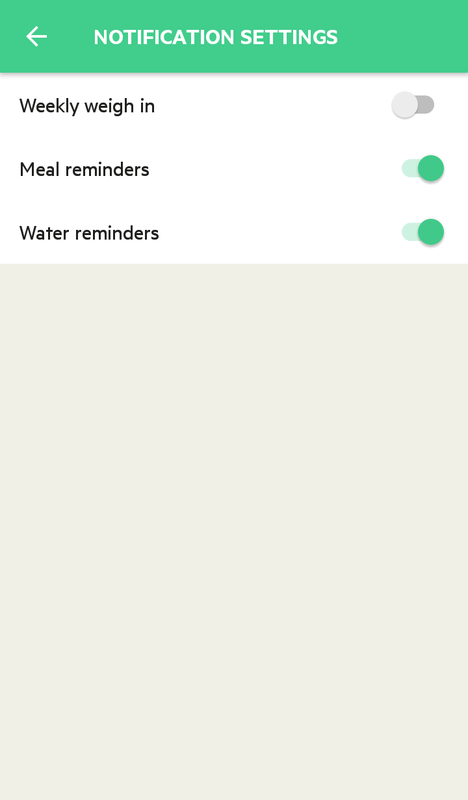 Unfortunately, there is no dedicated water tracker, so you have to manually add your water intake to another meal or simply log everything in the Snacks group. 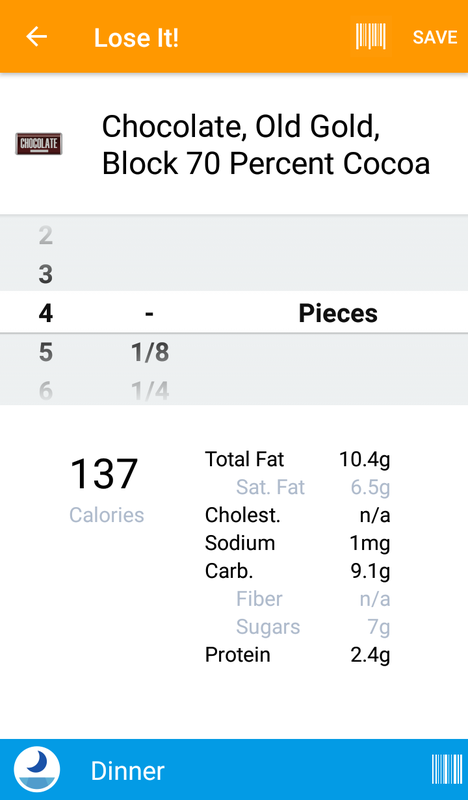 On the downside, serving sizes and units tend to be drastically inconsistent. 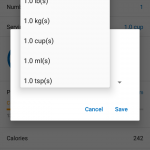 Sometimes items have a long list of options, including metric and imperial units, but other times they might have just a few, like cup and grams. 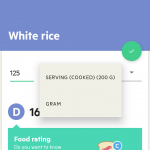 A nice addition to the app – which other apps do, as you can see below – would be “verified food”, which are items ideally reviewed by a human in order to ensure consistency and accuracy for the facts presented. 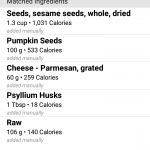 A particular challenge when using these calorie counter apps is homemade recipes. 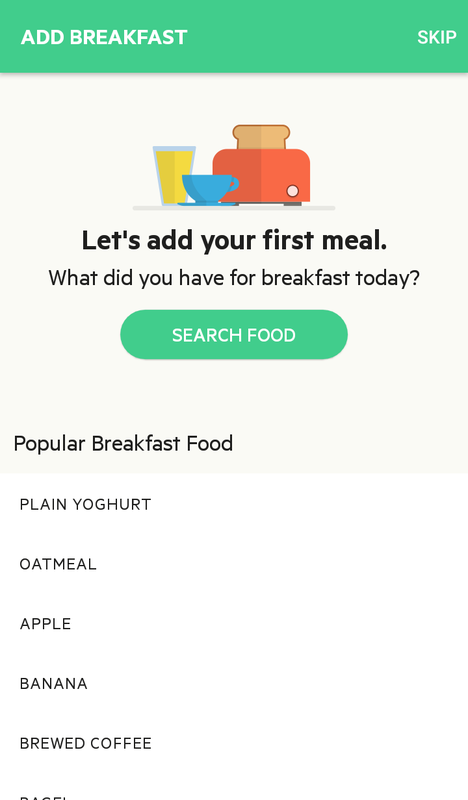 For example, you might have made a delicious coconut flour bread, or maybe a sesame seed bread, and you decide to have like 3 slices for breakfast on a certain day. 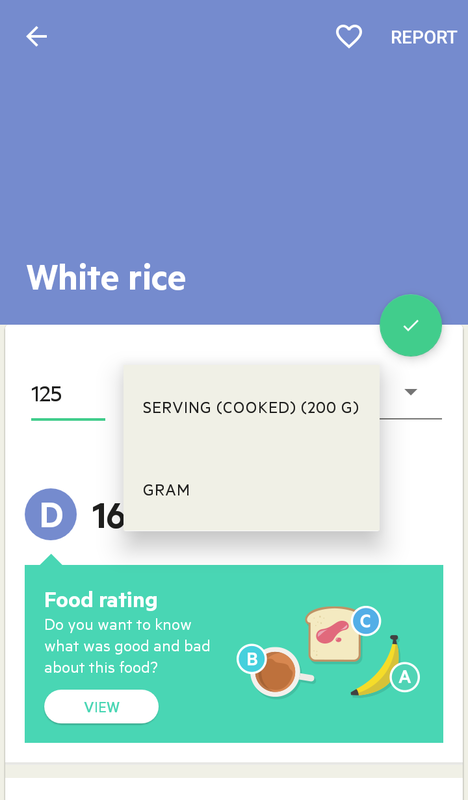 By creating a homemade recipe, you can input the respective ingredients, define the yielding portions and let the app do the rest. 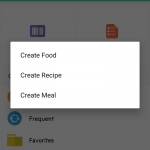 You can pick an existing recipe and use – if it happens to be similar to yours – though. 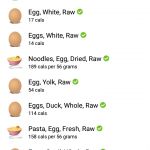 You can create custom meals, but that means you have to calculate the proportions and put the ingredients accordingly. 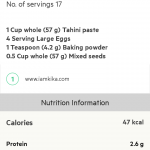 You cannot simply put all ingredients with their original quantities and say that you ate a third or a quarter of the recipe. 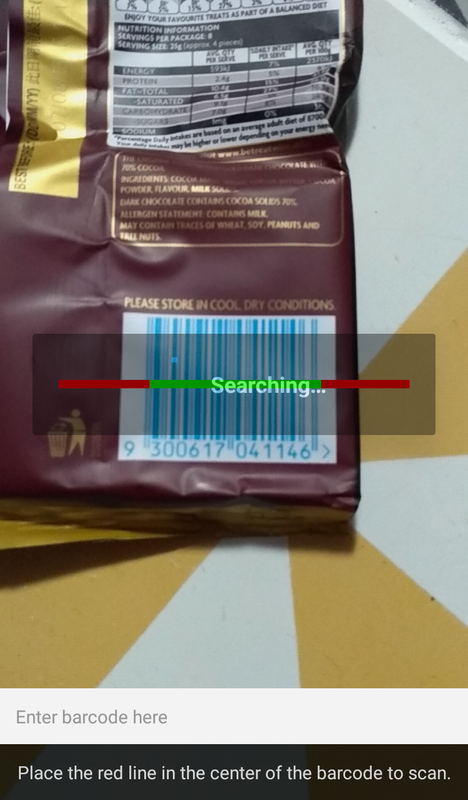 On the flip side, the barcode scanner seems to work well for industrialised products, where I had no issues scanning a variety of items during the test period. 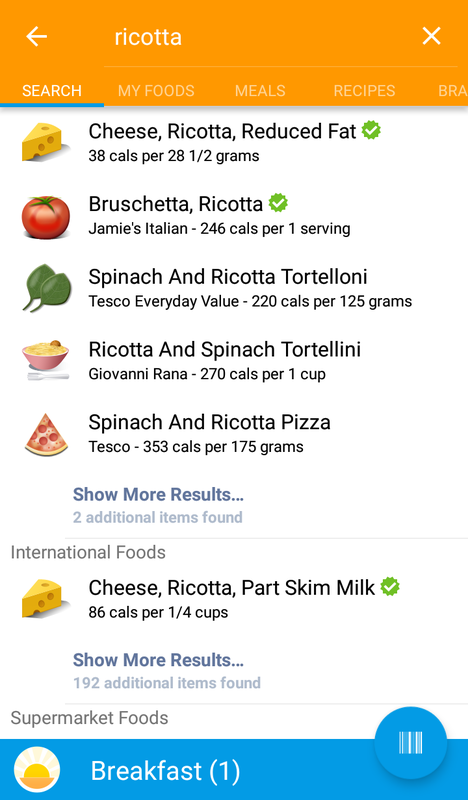 Another nice feature is the ability to add products by navigating through the menus but starting from a particular supermarket brand, which is particularly useful if you normally buy their home brands. 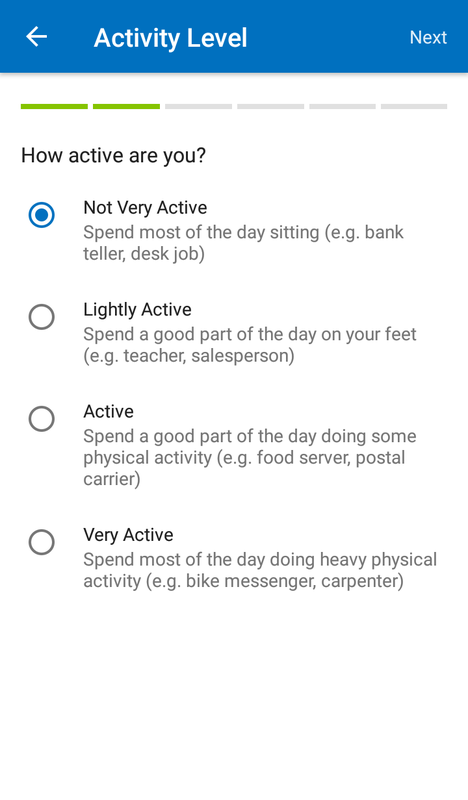 As I said above, you can always manually input any activities you have done throughout the day, but it would be nicer to have it done automatically, right? 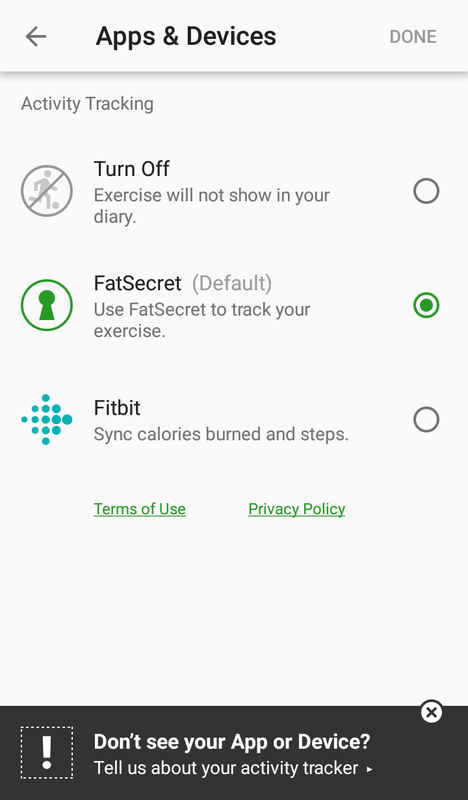 FatSecret currently supports integration with the popular Fitbit wristbands, which can seamlessly sync its step counter and calories burned. But that is the only integration currently available. 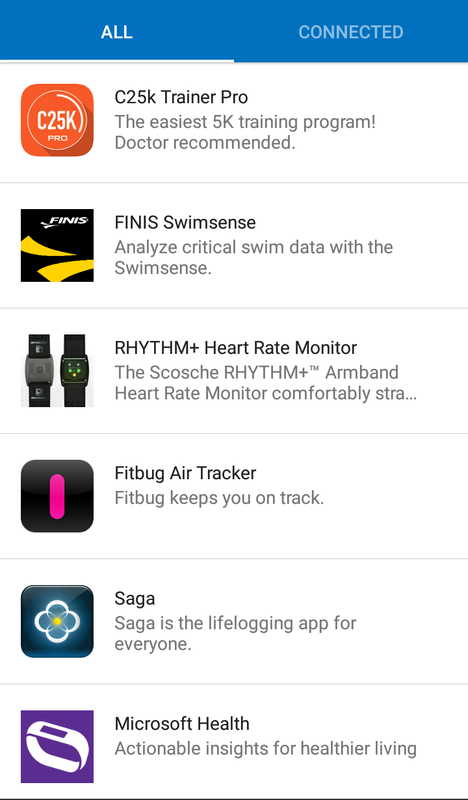 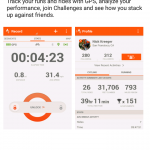 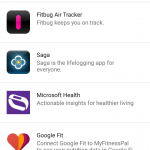 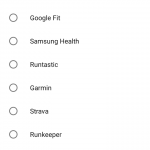 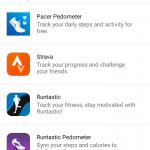 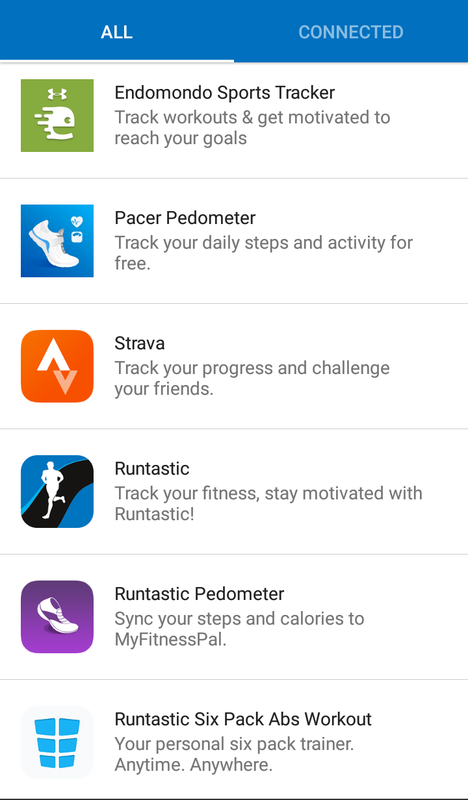 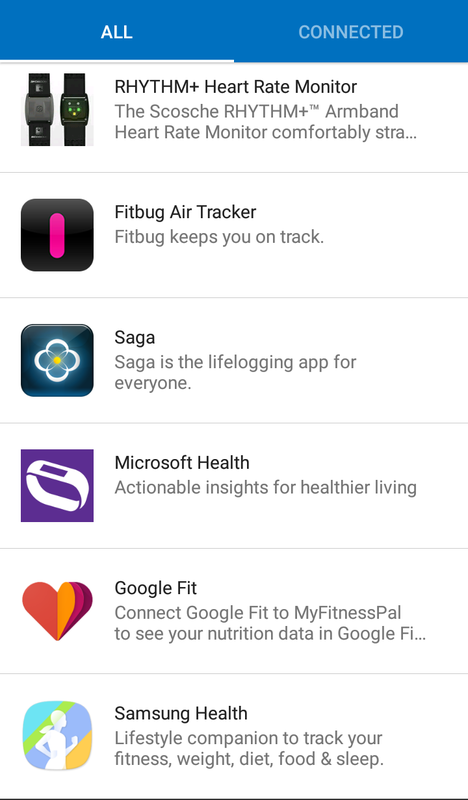 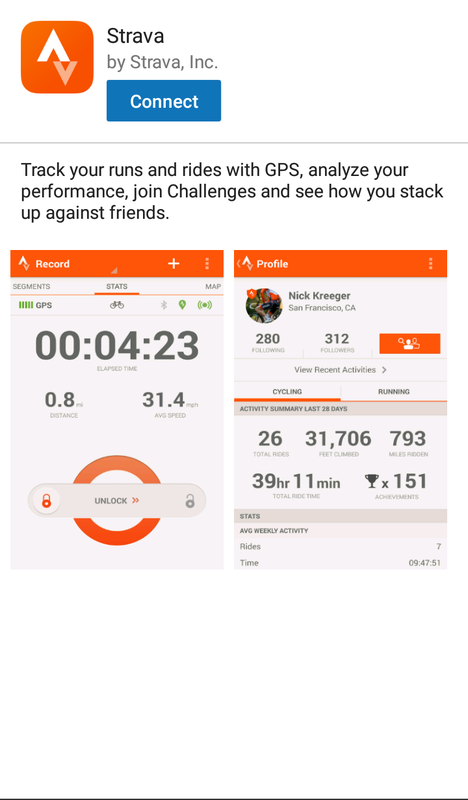 An in-app feedback page asks for your preferred app or device for activity tracking, where you will find other usual popular options such as Google Fit, Runtastic, Strava, etc... so I would expect new integrations to be made available in a near future. 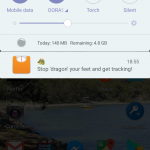 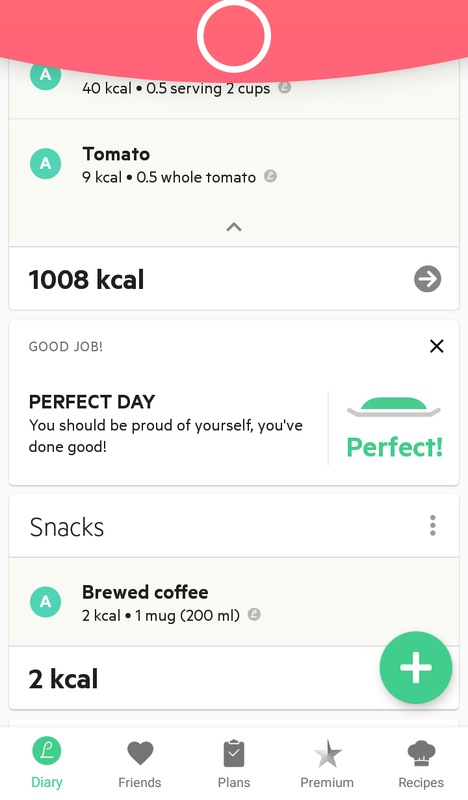 Especially for the very first days of your calorie-counting journey, it would be nice to receive app notifications reminding you to log items. 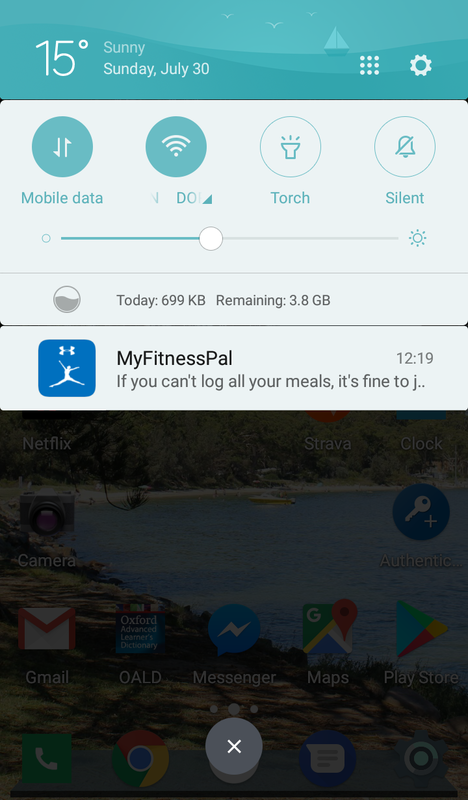 Unfortunately, FatSecret does not send you notifications to help you with that. 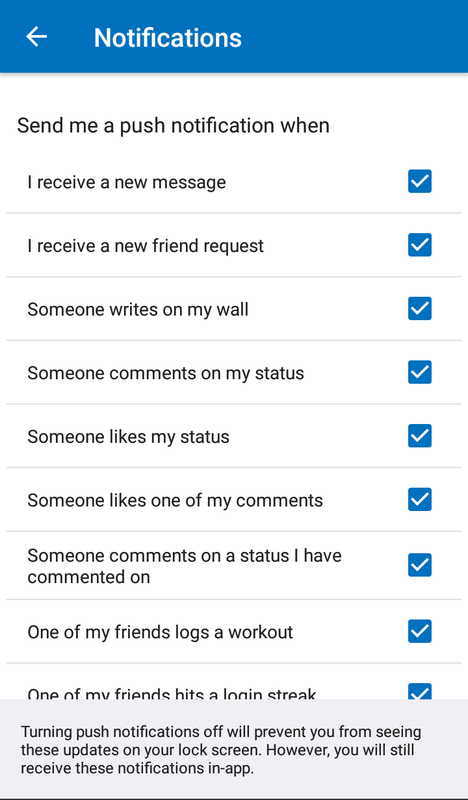 I looked at every single option in their Settings menu, but nothing about notifications. 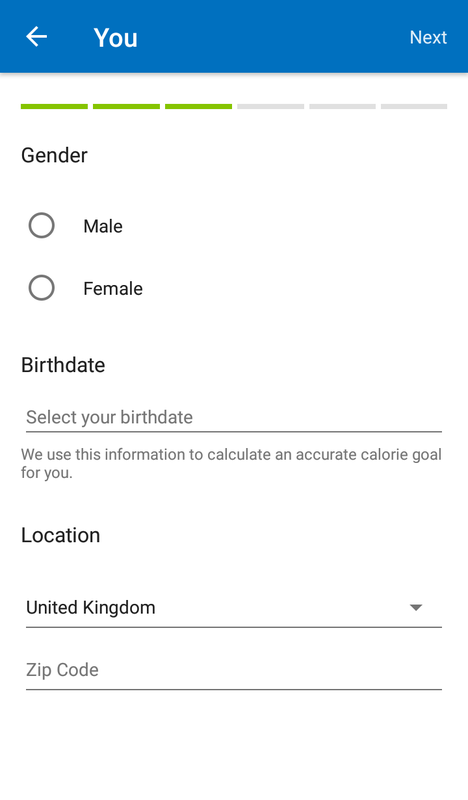 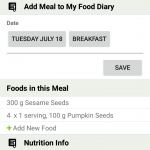 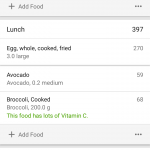 As you know, the longer you wait to input this information into the app, primarily due to forgetting what you ate or maybe due to having to add multiple meals and their details at once, the worse it gets. 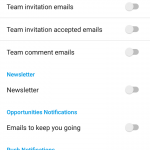 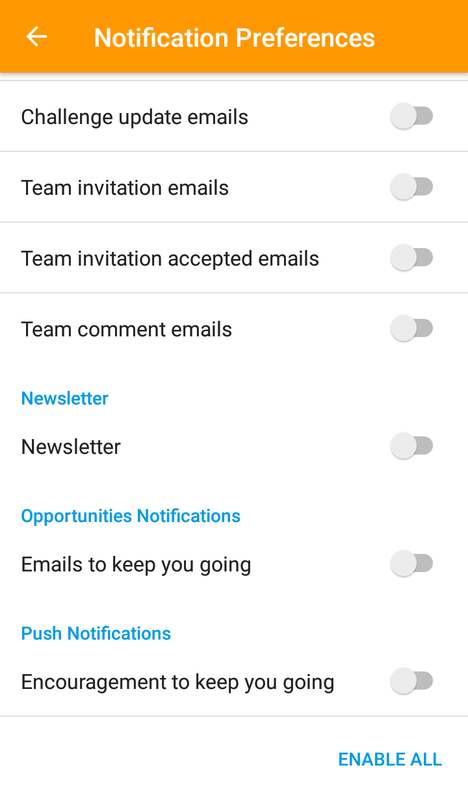 So notifications can help you stay on track and avoid creating the snowball effect above. 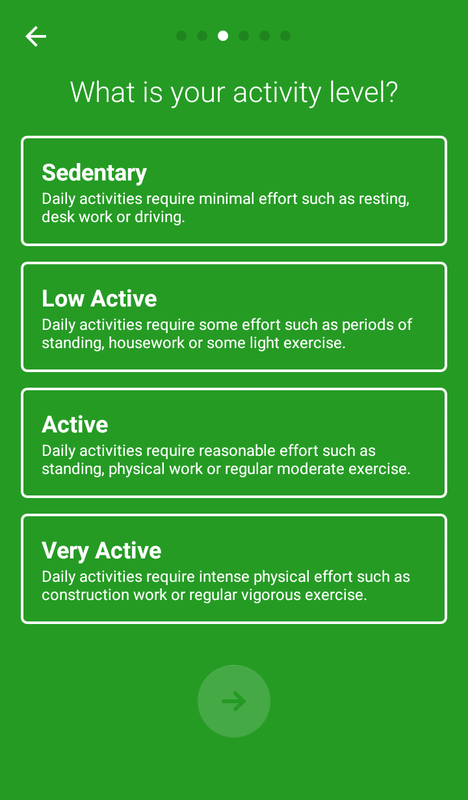 Reports are available in several ways, but you are most likely to use either the daily view (which updates as you add things you have eaten, activities, etc…) or the aggregated weekly report. 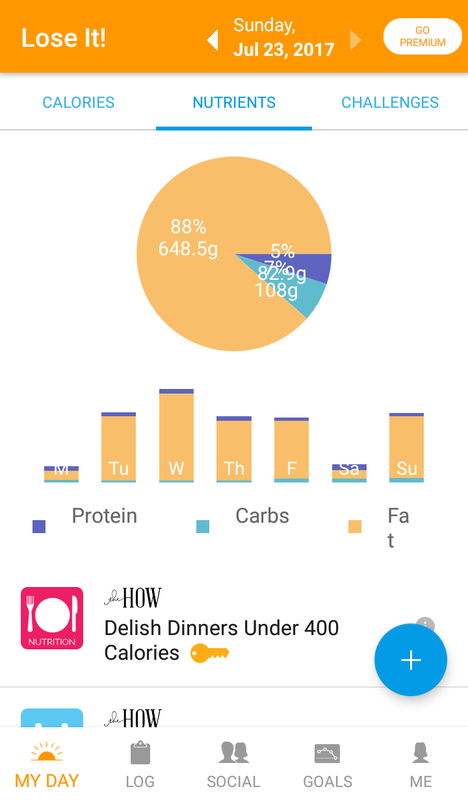 The daily view shows, unsurprisingly, as the most prominent information your calorie counter for that day and the remaining calories. 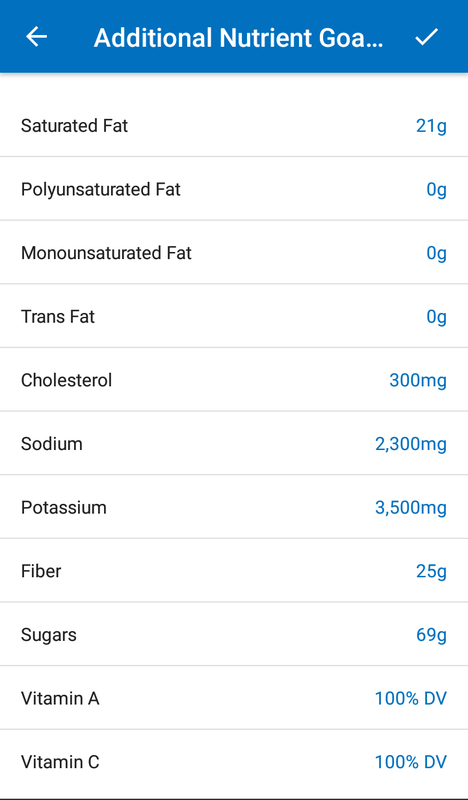 You can also see the aggregated amounts for the following items: total fat, cholesterol, sodium, total carbs, dietary fibre, sugars, and protein. 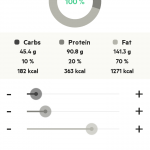 There is also a pizza chart available where you can quickly grasp your intake of macronutrients: carbs, fat, and protein. 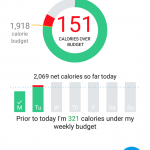 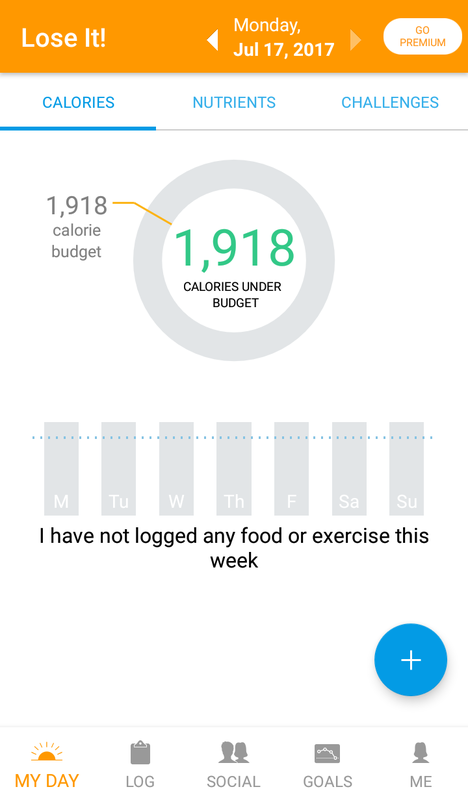 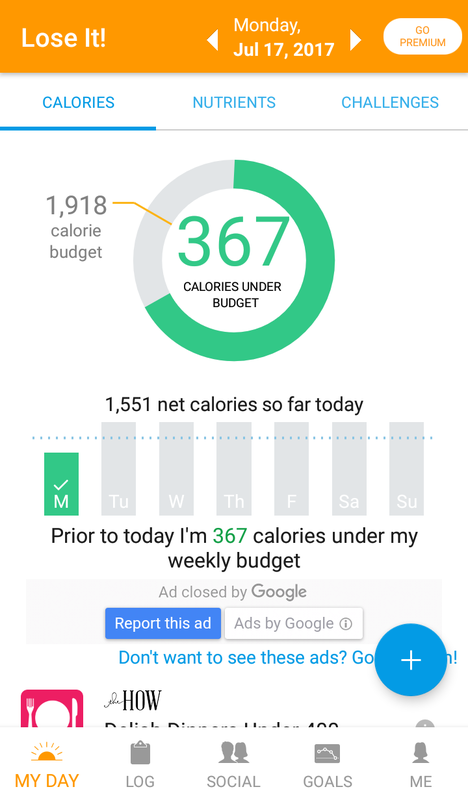 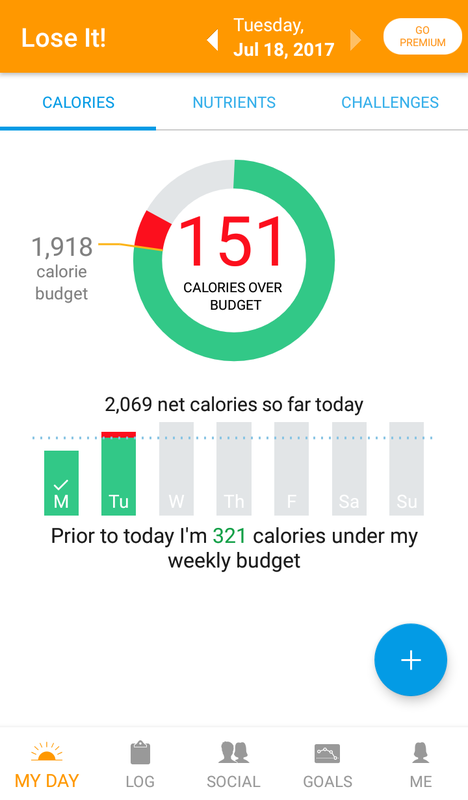 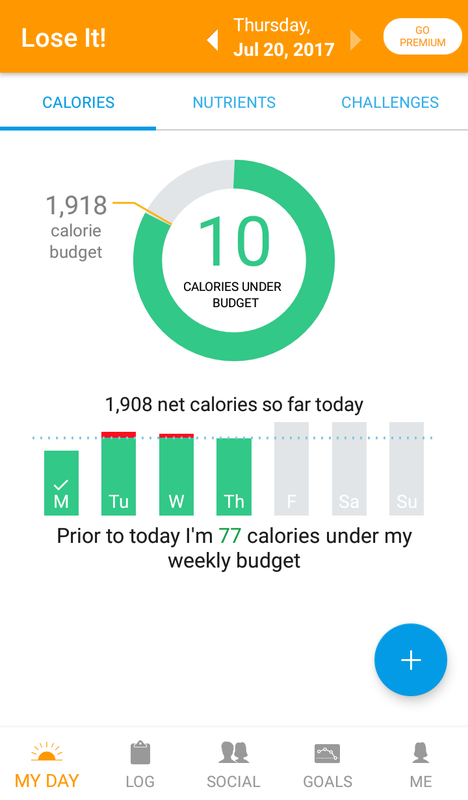 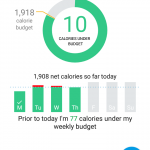 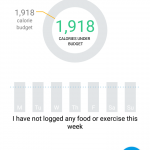 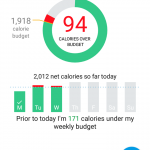 Later on, when you have enough data to make the weekly report useful, you can easily visualise how close you were, on a daily basis, of staying below your calories goal. 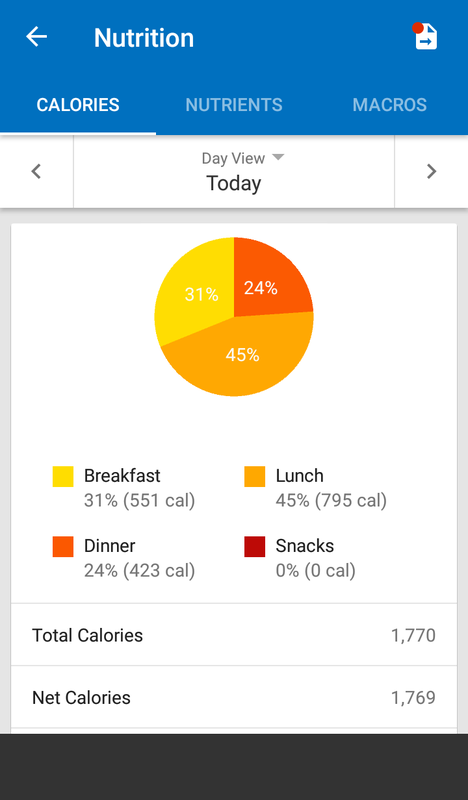 It also nicely displays the distribution of your 4 main meals: breakfast, lunch, dinner, and snacks/other. 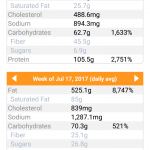 Two other views are available: a similar chart aggregating macronutrients (useful when you are thinking more about carbs, fat, and protein, rather than individual items) and another with the complete breakdown of the nutrients logged during the week. 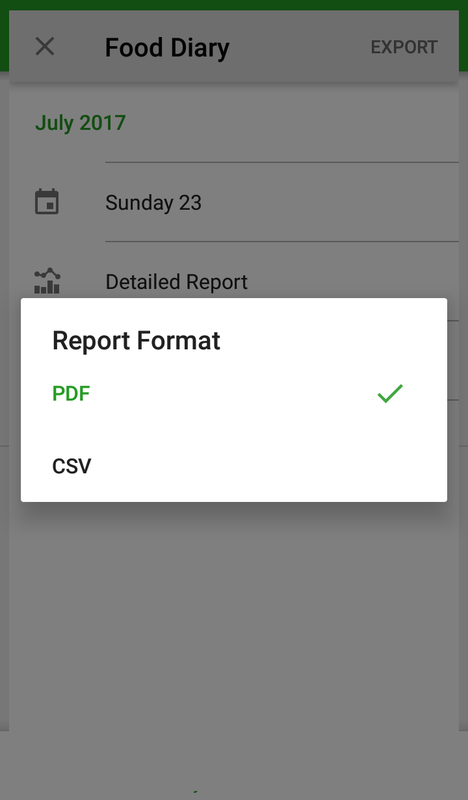 Finally, it is also possible to export your diary into two formats: PDF and CSV. 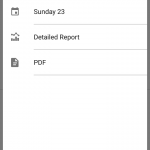 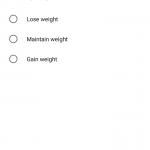 PDF being an interesting option in case you need to share something with a personal trainer or a nutritionist, for instance. FatSecret performed quite well in most of the aspects analysed by me; with the notable exception on the inability to create recipes from the mobile app. 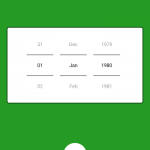 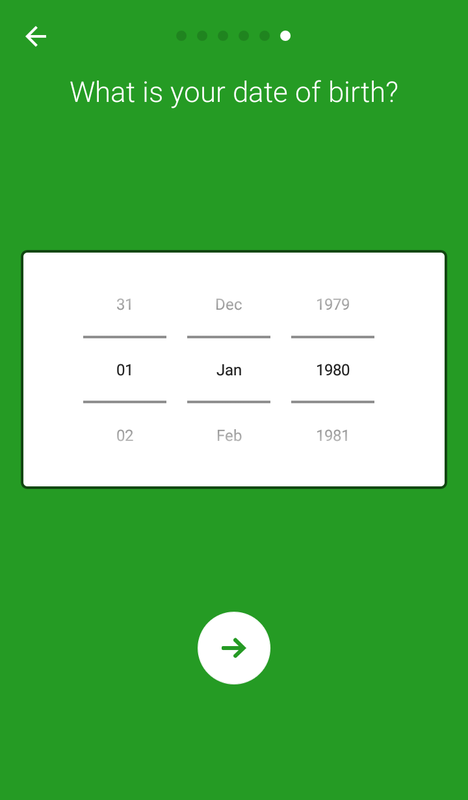 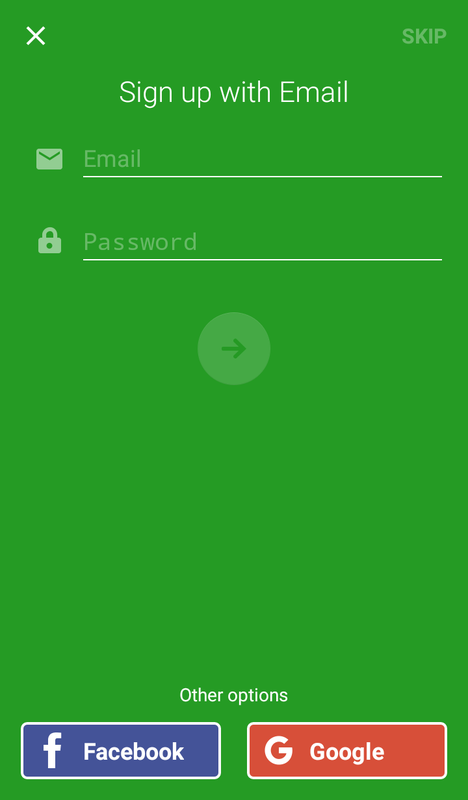 User interface is polished and friendly; it was very simple to log multiple items in a row. 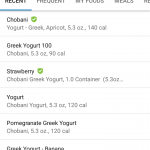 Search results were also accurate, in general, but having “reviewed/certified“ products would be a nice addition to the product. 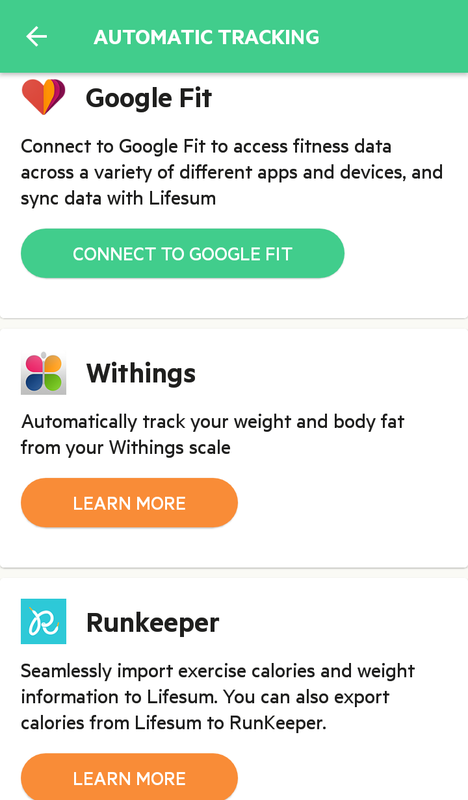 Finally, FatSecret has no premium features – everything is 100% free, which sets it apart from the other apps in this topic. 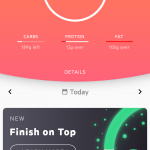 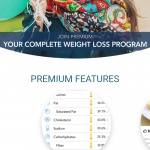 Lifesum is a freemium app which includes a daily calorie counter; users can subscribe to Lifesum Premium in order to unlock all features of the app. 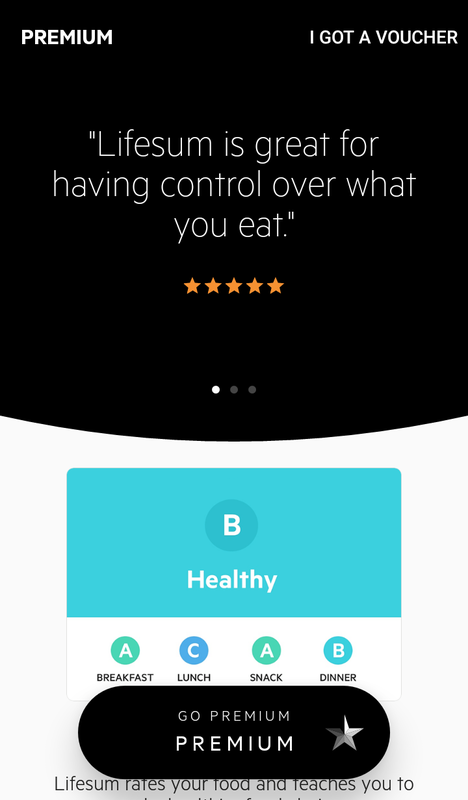 For the purposes of this review, only features available to all users were considered and tested. 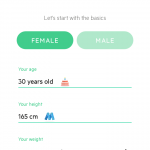 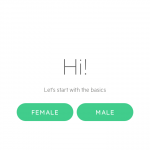 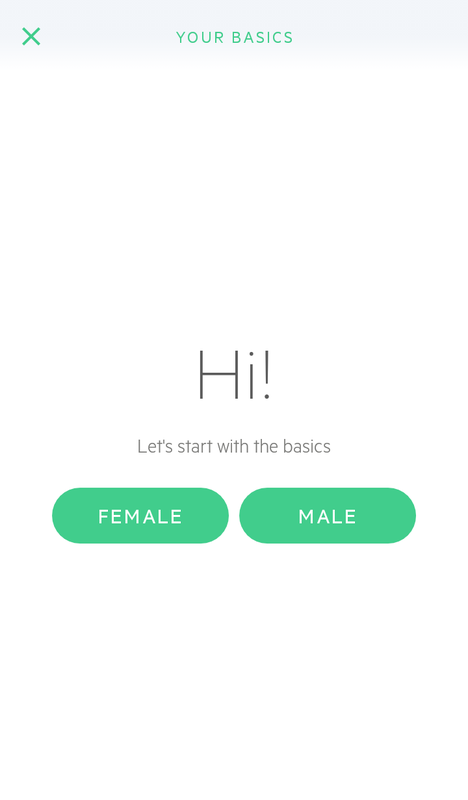 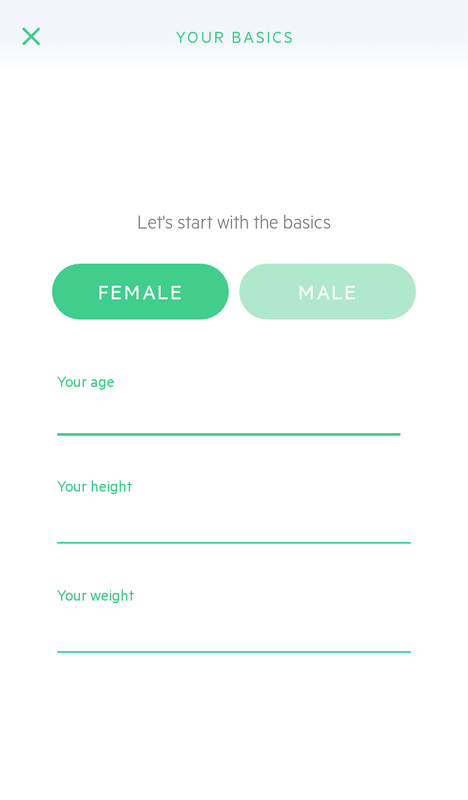 The initial setup is quickly accomplished via the streamlined onboarding flow, where you simply need to answer a few questions about your goal (be healthier, lose weight, or gain weight/muscle), set your gender, and provide 3 basic pieces of information about you: age, height, and weight. 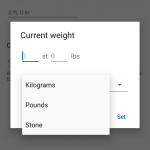 Negatively surprising is the option to only specify your weight in … stones and pounds??? 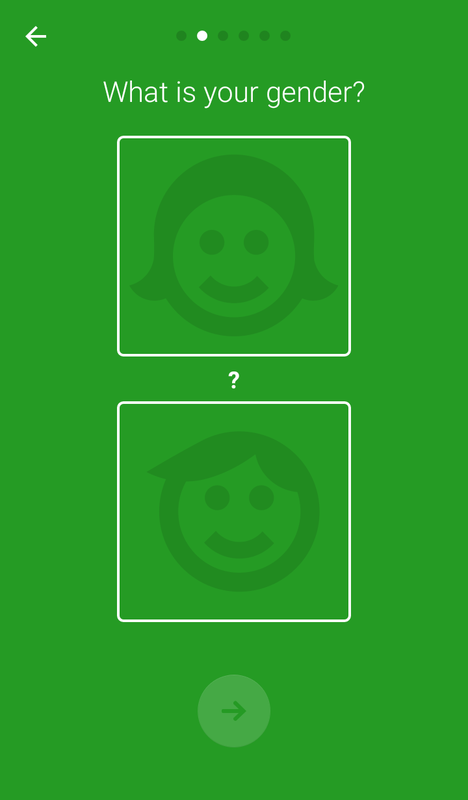 A bit of friction to start, but a Google search later and I had the values I need to complete the flow. 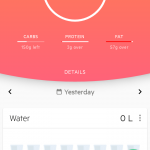 Of course, the most basic setting would be to define a certain limit for your daily intake of calories, and Lifesum obviously provides that. 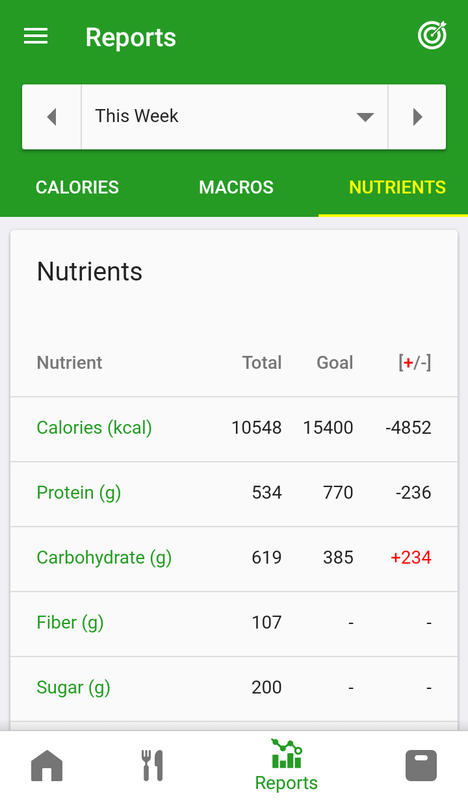 In addition to that, you can also set your personal ratio of macronutrients (carbs, protein, and fat), which helps to not only stay within your limit of calories but also how these calories should be composed of in terms of these macronutrients. 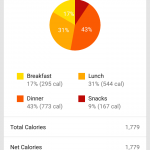 The daily tracker of calories is sub-divided into 5 logical sections: breakfast, lunch, dinner, snacks, and exercise. 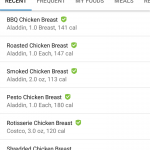 As usual, you can use a textual search to find the items you want to log or simply navigate through the menus to narrow down individual products of a certain category. 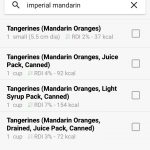 Generally speaking, finding products by keywords gives you a mixed bag of results, where you will encounter branded products alongside homemade items ordered in no logical way, at least for me. 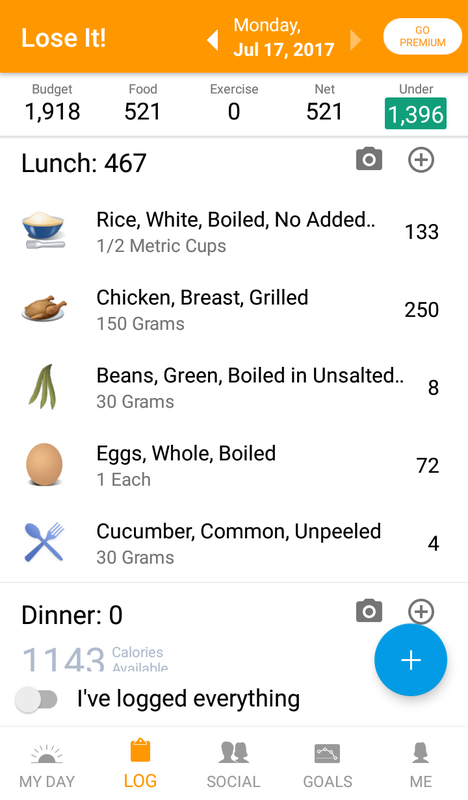 Also similar to the other apps, inconsistent serving sizes are commonly found. 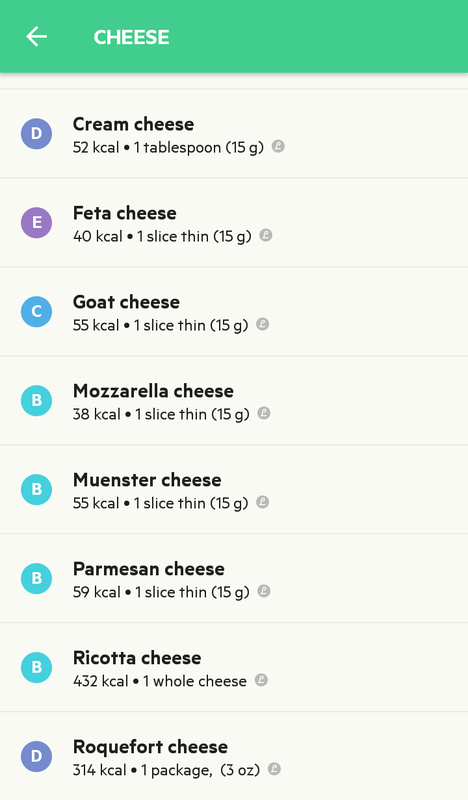 On the other hand, when navigating by categories, if you pick something like, let’s say cheese, the present listed is basically composed of “verified products” (even though they are not labelled as such) in their non-branded versions. 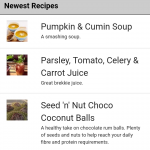 Of course, homemade recipes of pretty much everything will subject to a range of variations, but it is good to find them somewhere in a nicely organised manner. The app also offers a dedicated water tracker, where you can quickly tap to add a glass (250ml) to your logs. 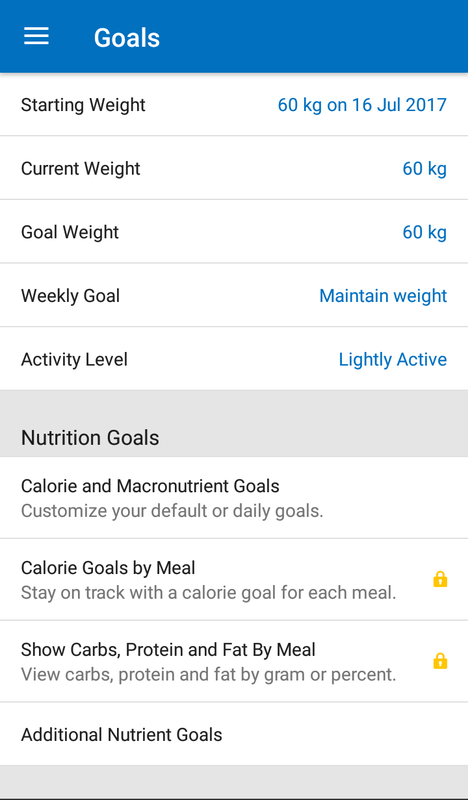 It is also possible to set a daily goal (for example, 2 litres), but unfortunately, the app does not send you reminders from time to time, which might be useful until you are used to a certain routine. 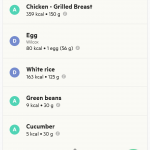 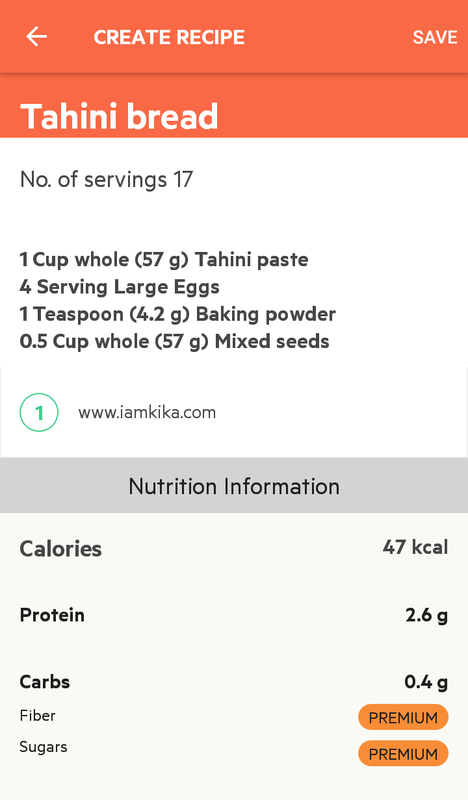 Using the app interface, you can easily create recipes to help you to stay on top of the personalised meals you have. 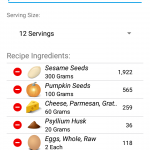 The process to create a new recipe on Lifesum is exactly what you would expect: add the necessary ingredients and their quantities, then specifying the number of servings resulted. 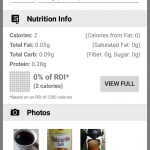 The app calculates the calories according to the serving size and you can simply say how many servings you are having. 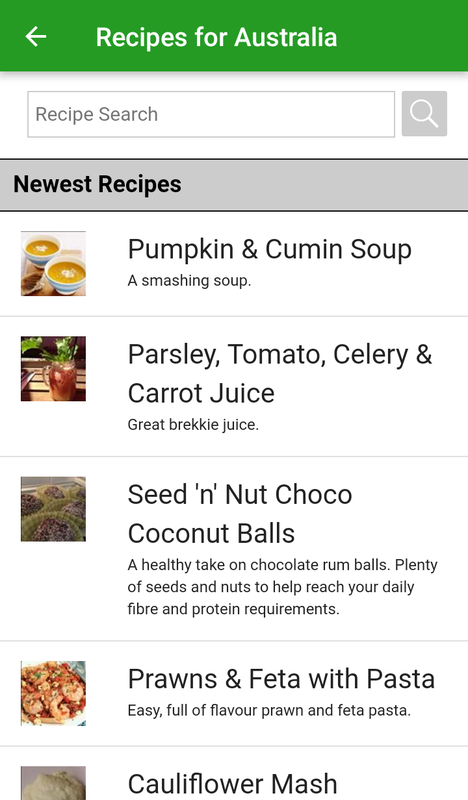 On the not-so-bright side, free users can create a maximum of 2 recipes only. 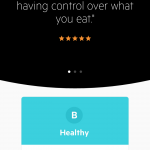 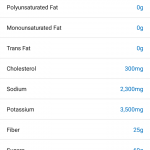 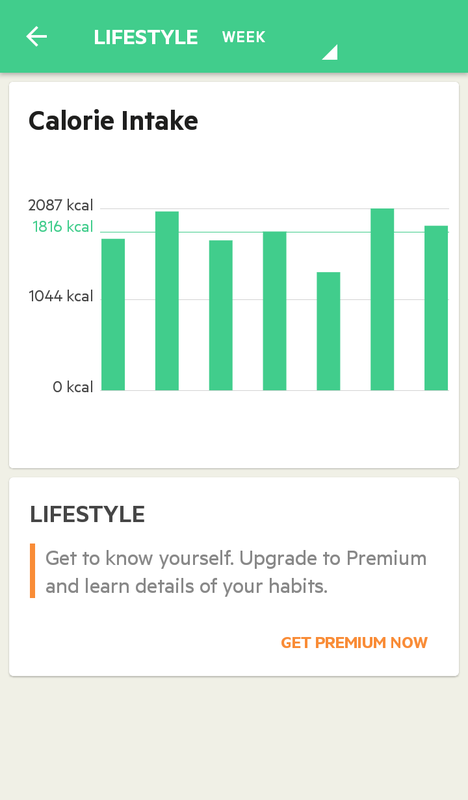 So, if you are going to use Lifesum as you calorie counter app, that will be a strong push towards the premium tier. 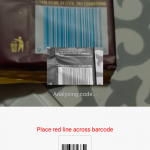 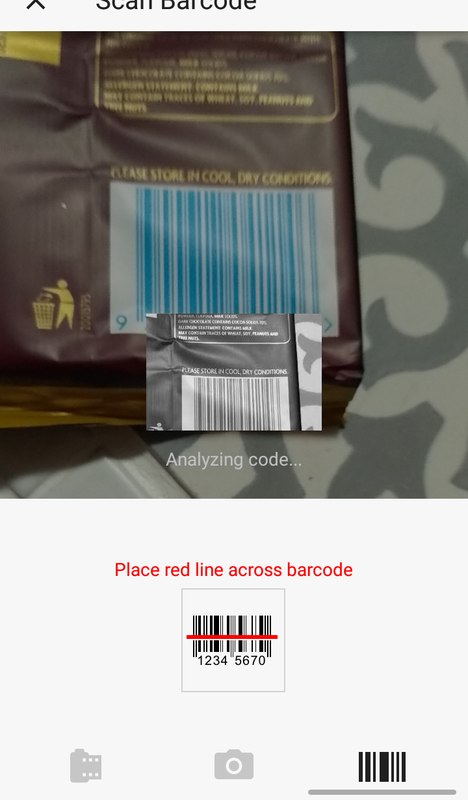 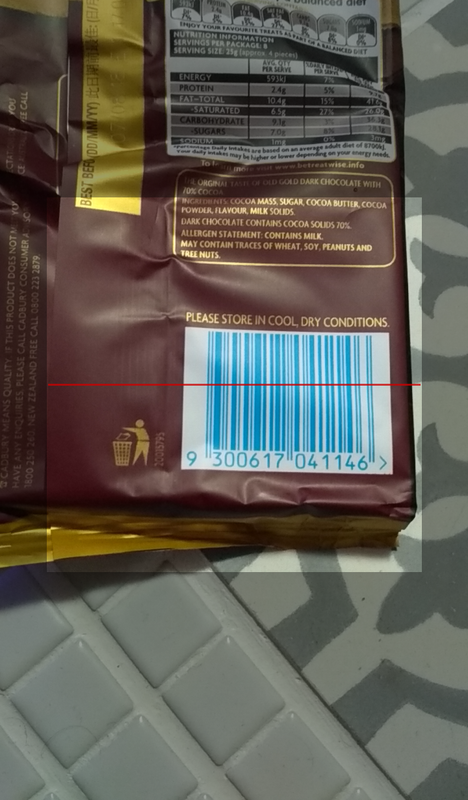 And finally, similar to the other apps, barcode scanning worked nicely for the several products I tested. 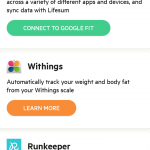 Being a free user, Lifesum allows you to automatically track your fitness data from Google Fit. 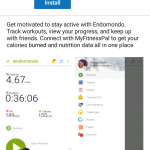 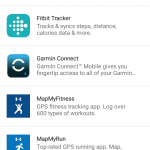 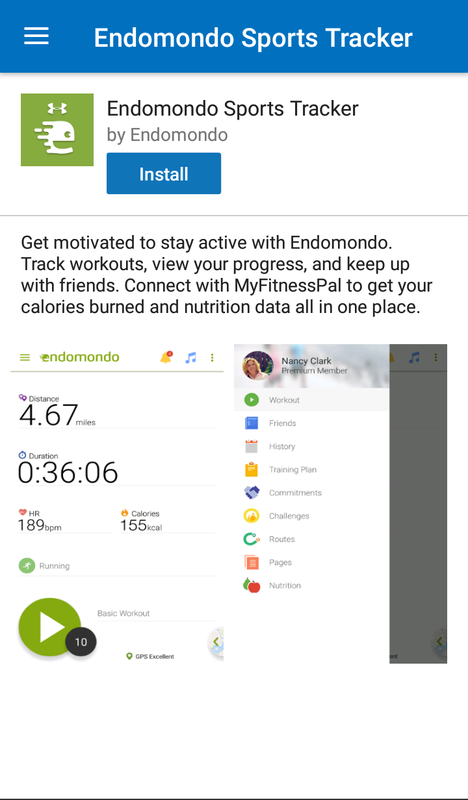 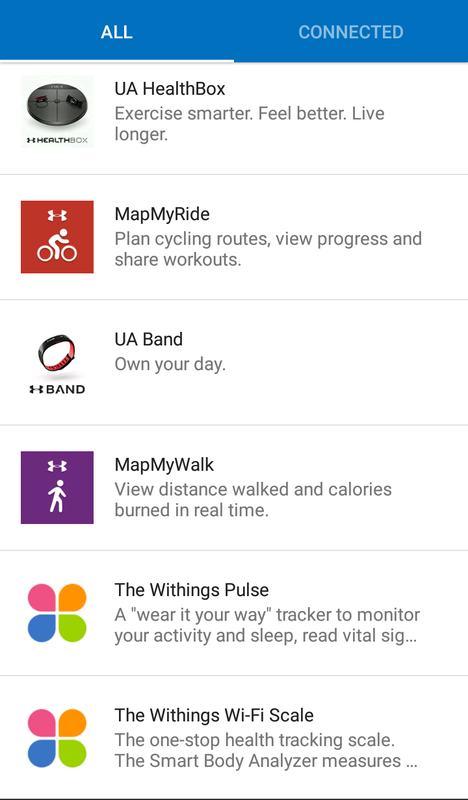 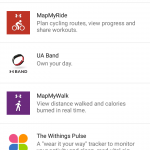 Upgrading to the premium plan unlocks automatic sync and track with the following popular apps and devices: Runkeeper, Fitbit, Endomondo, Withings, Moves, and Jawbone. 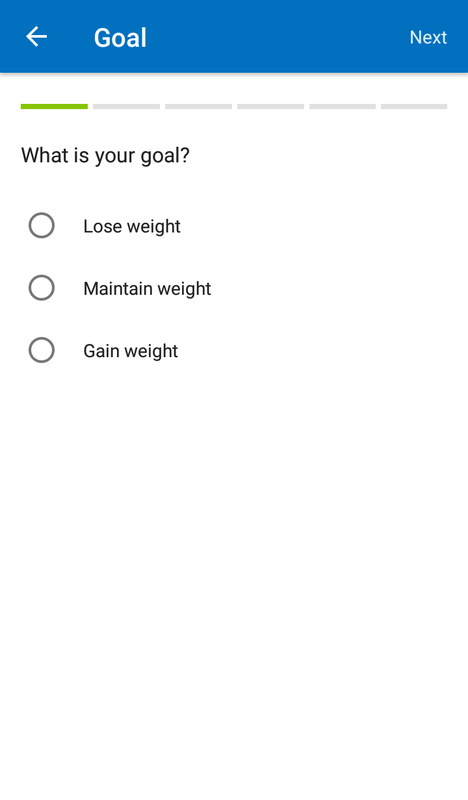 If done manually, you can find activities based on keyword matching or simply browsing through a comprehensive list of exercises. 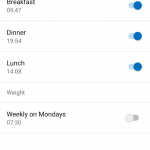 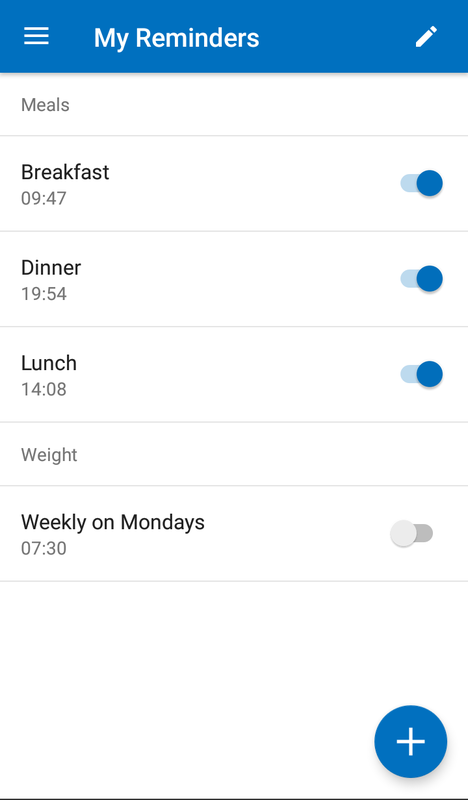 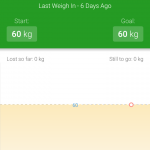 The app offers you notifications for three types of events: “weekly weigh in“, “meal reminders“, and “water reminders“. 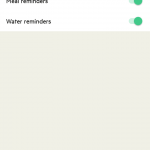 Where only “water reminder” is enabled by default. 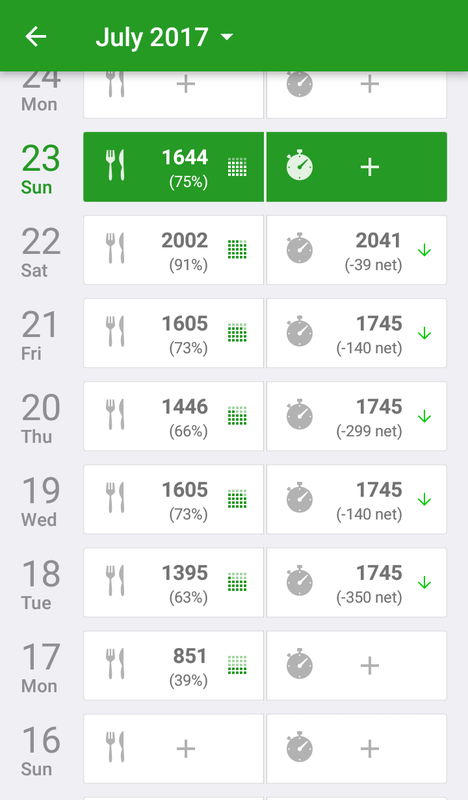 During my tests, I decided to stick with the default to start and the app only notified me to log my water intake after 10 days using the app. 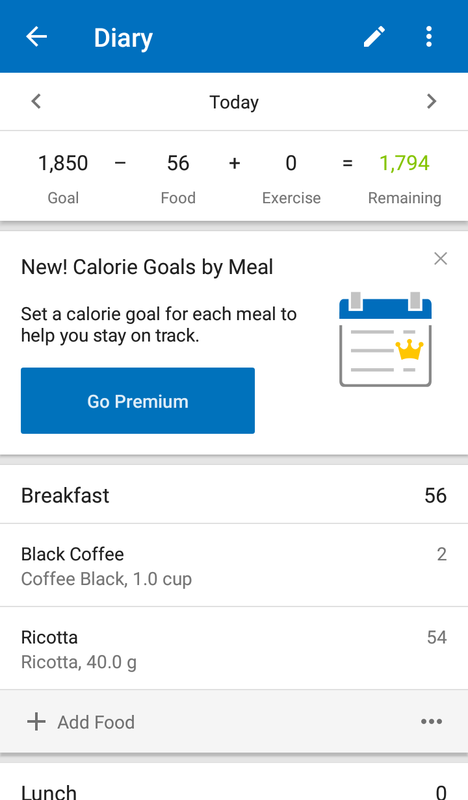 Not exactly what I expected from something that happens multiple times a day, like drinking water. 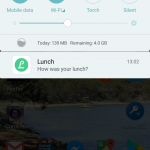 I understand multiple notifications on the same day would be rather annoying but would be nice to have a single notification sent initially and then react accordingly. 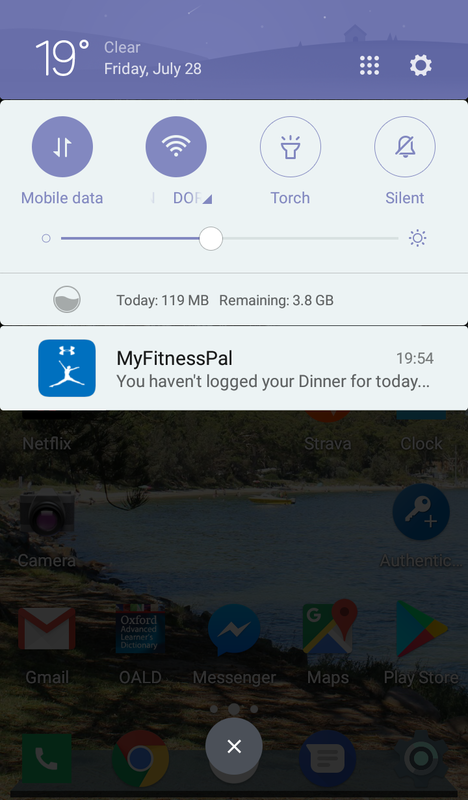 On the other hand, “meal reminders” worked as expected, suggesting me to log my stuff just around the typical lunch and dinner times. 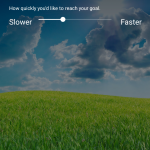 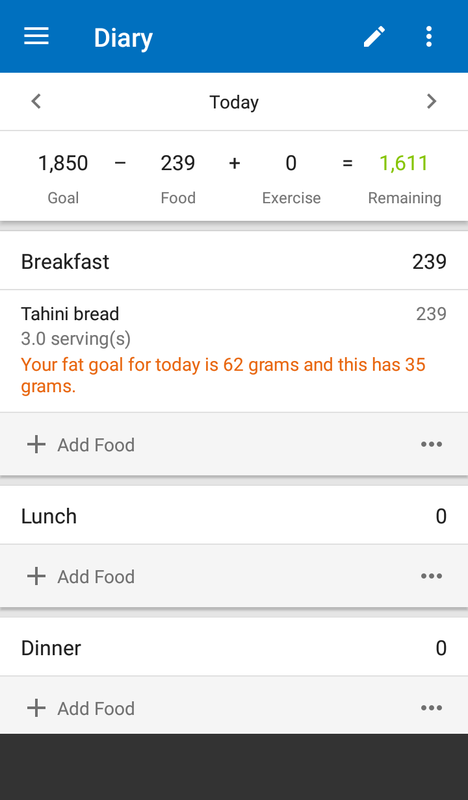 Finally, not exactly a notification, but the app shows you motivational messages as you log your entries and the app calculates you are on track to reach your daily goal. 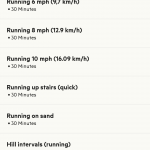 I found them particularly useful to keep the motivation up! 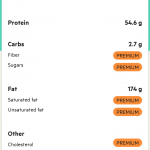 Lifesum offers a limited set of reports or charts for free users. 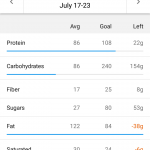 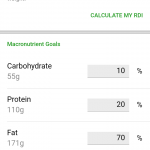 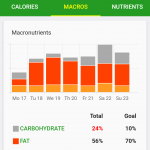 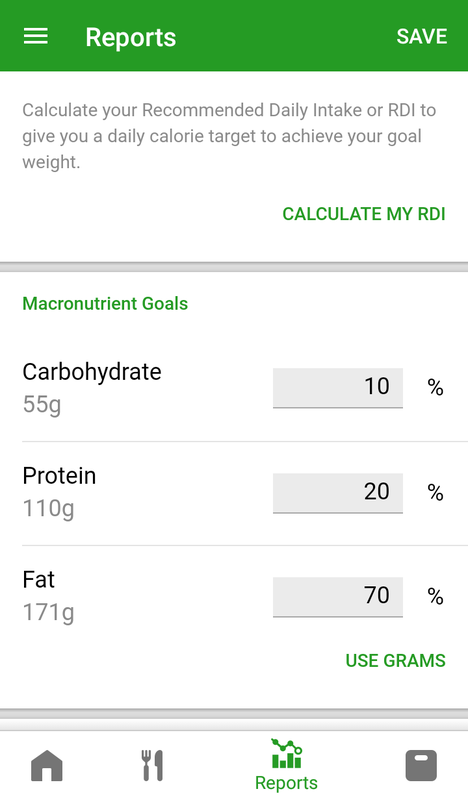 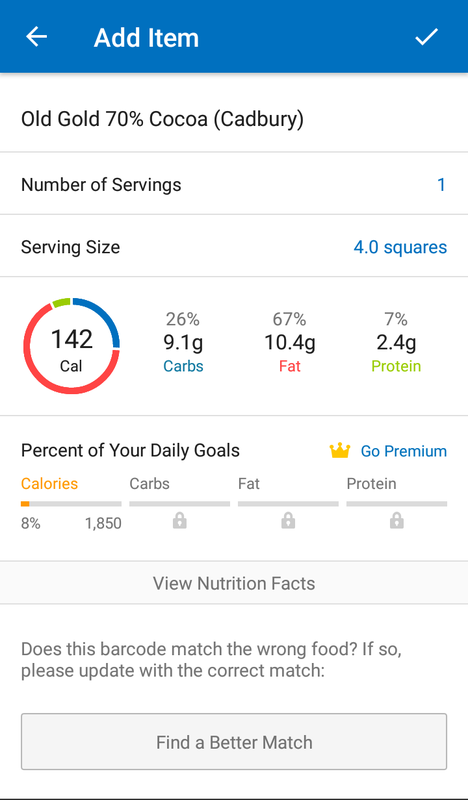 For the daily calorie counter tracking, the app displays a pie chart with a distribution of your nutrition intake grouped by the 3 main macronutrients: carbs, protein, and fat. 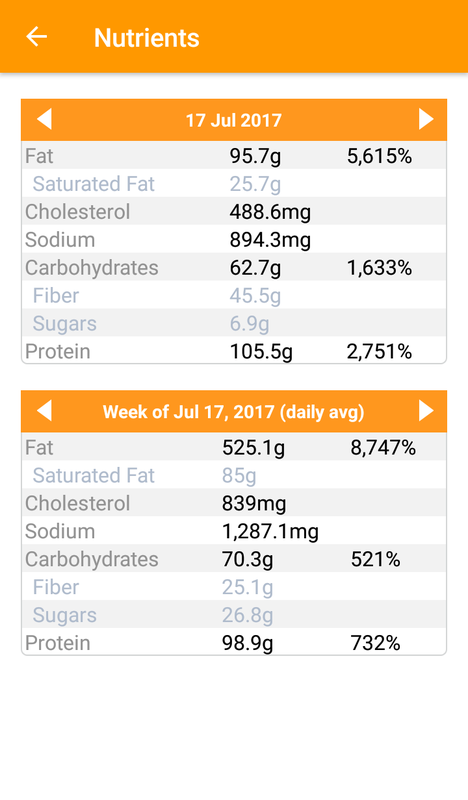 You can see absolute numbers (how many grams, for example) as well percentages (like 21% of your intake was composed of protein). 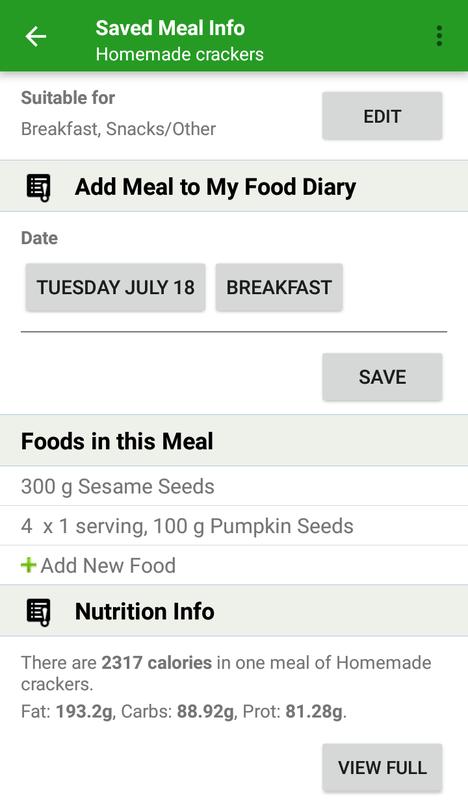 There is a tab where you can take written notes to create a progress diary, but that is only available for premium users. 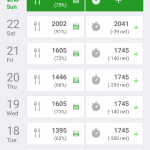 As the only weekly view available for free users, there is a column chart where you can easily see how well you did to stay within your planned calorie threshold. 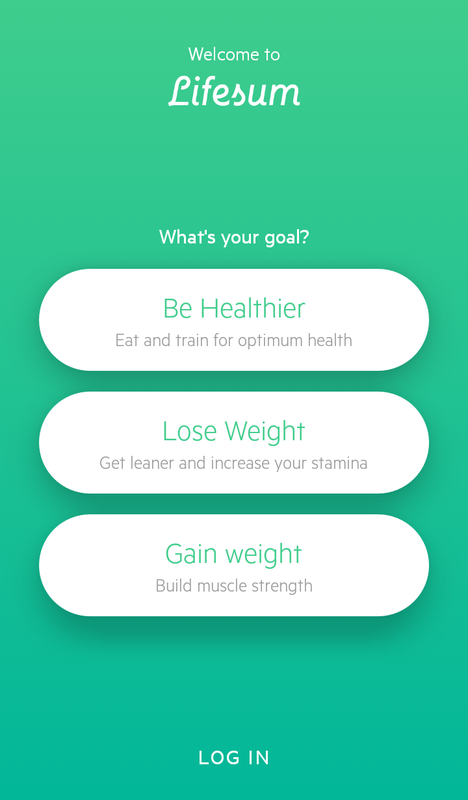 There is a call-to-action about learning more about your lifestyle, which is only available for premium users, but the following page does not give any details about exactly you will find in this section of the app. 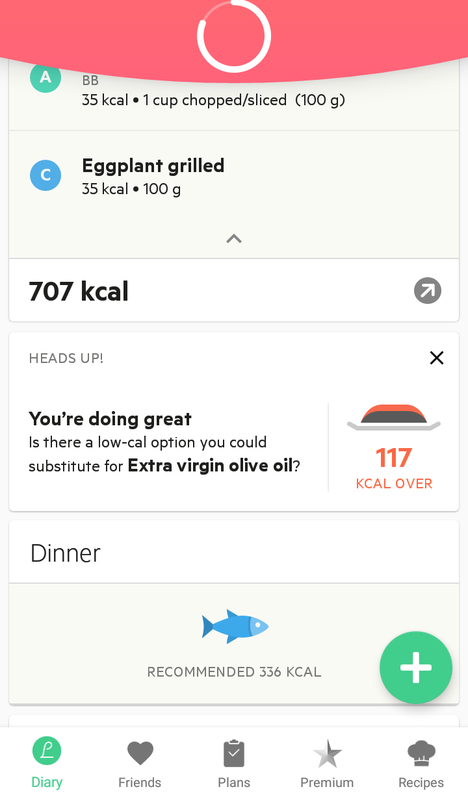 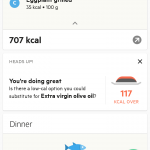 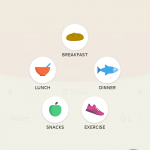 Lifesum turned out to be a good calorie counter, with all essential features available even for free users. 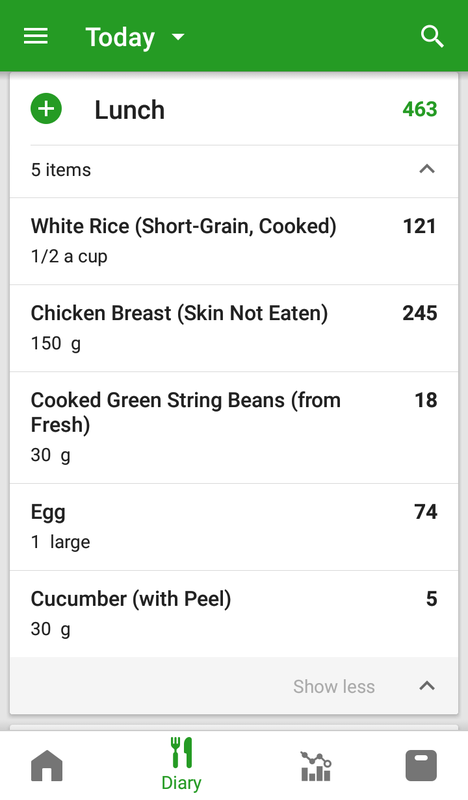 It was very simple to add multiple products in sequence and a “smart action” was the recent tab, which shows you items you had for the same meal, instead of simply displaying everything you had logged before. 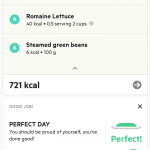 For example, although perfectly possible, it is rather unlikely you will have a salad for breakfast simply because you had it for dinner the day before. 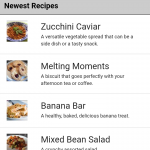 Most significantly was the creation of recipes, which is limited to a maximum of two without a premium plan. 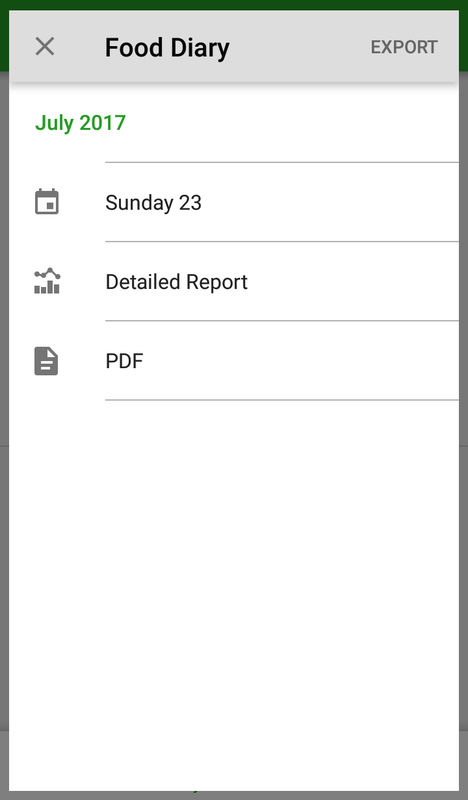 The reports are exactly the essential ones, which could be fine when analysed on their own, but a bit limited when compared to other apps. 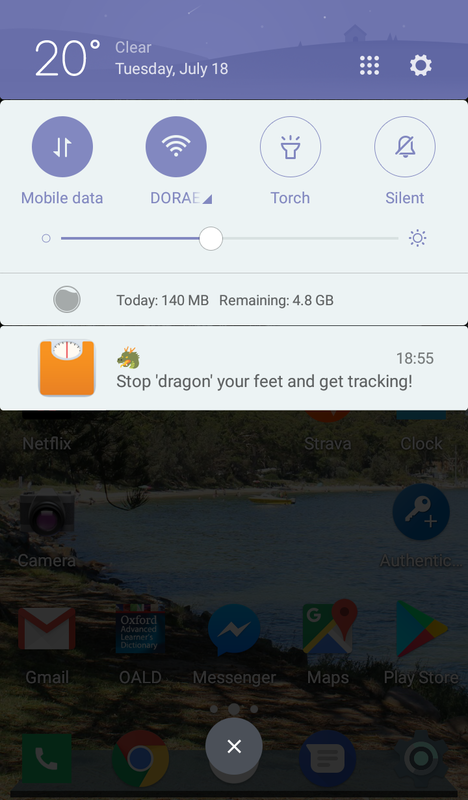 Finally, push notifications as reminders are definitely a useful feature. 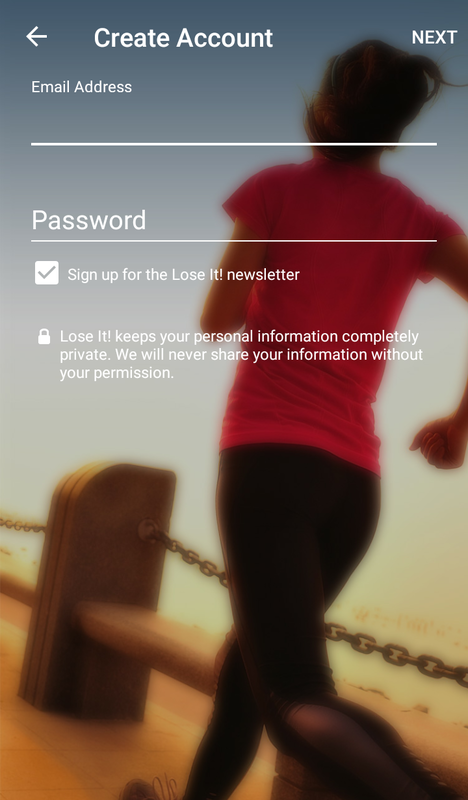 Lose It! 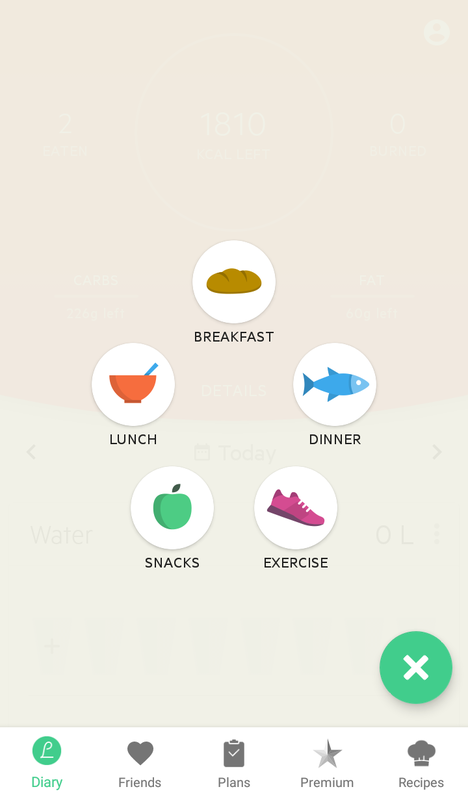 is a freemium app which includes a daily calorie counter; users can subscribe to Lose It! 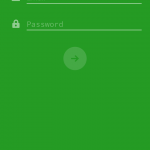 Premium in order to unlock all features of the app. 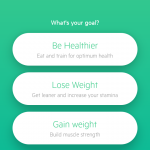 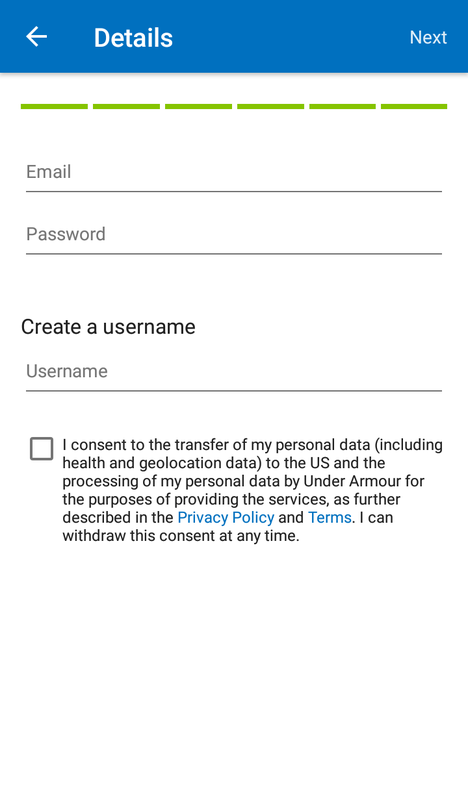 To start using the app you just need to complete a simple and functional signup form, which consists of three pages asking for relevant information to define your current lifestyle and calculate an initial goal. 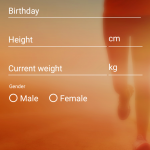 The first screen asks for a few pieces of information, namely: birthday, height, weight, and gender. 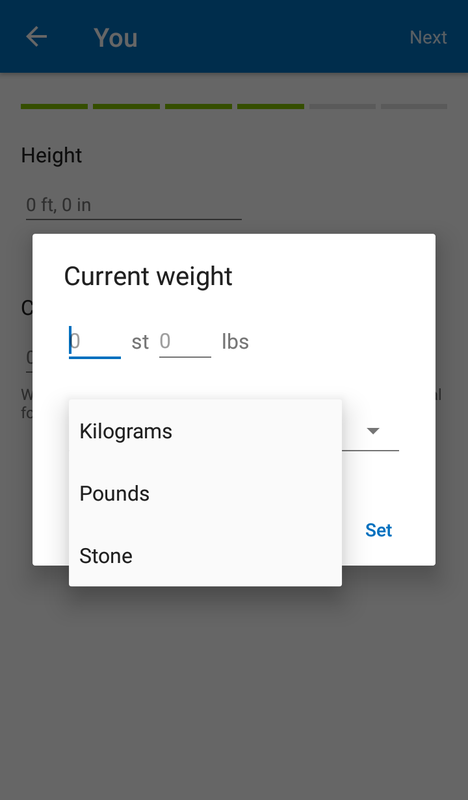 On the positive side, when relevant, you can always use the units more familiar to you, either metric or imperial. 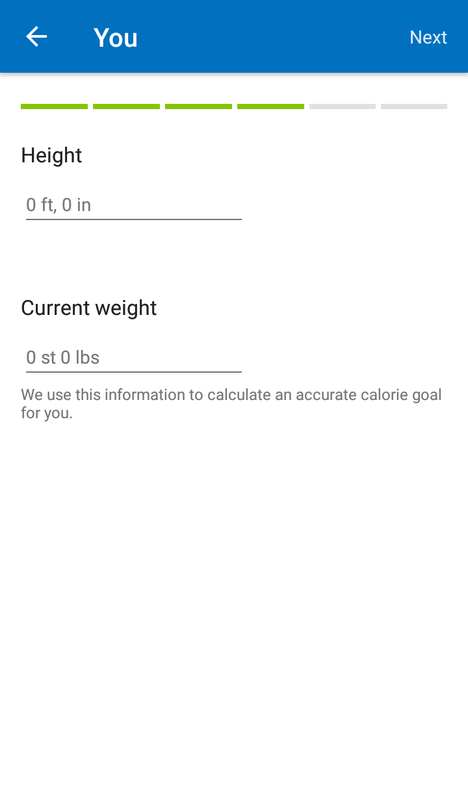 Next, you should define your target weight and how fast (or slow) you want to reach it. 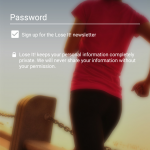 Finally, you simply need to complete the account creation process with your email and a password and you are in! 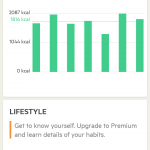 Without a premium account, there is only one goal available that you can modify: your target weight. 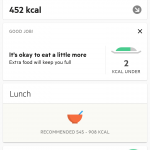 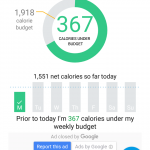 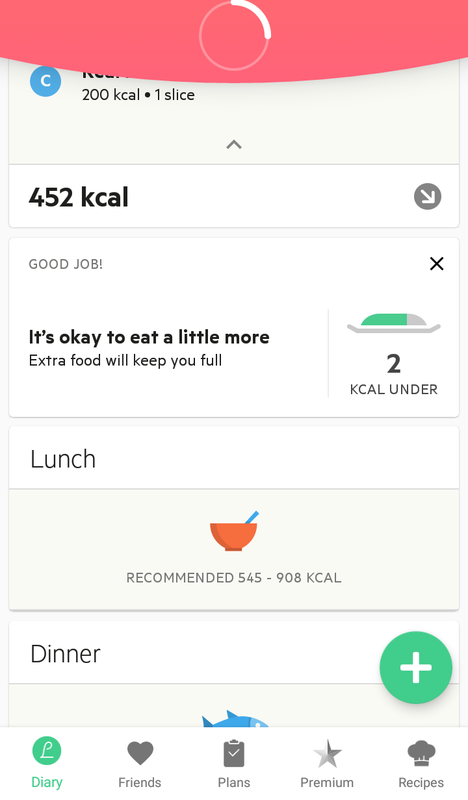 Based on the value you put there, which in other words means: keeping your current weight, losing and gaining weight; your daily calorie budget is automatically calculated for you by the app. 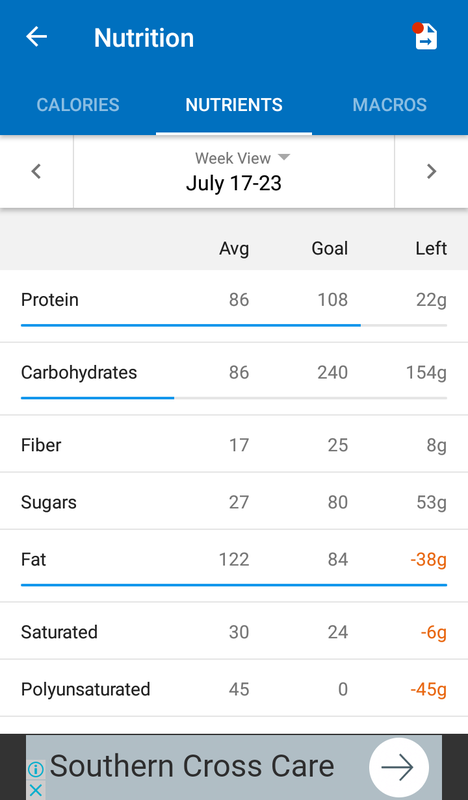 Similarly, only premium users can define a percentage of macronutrients to be tracked (carbs, protein, and fat). 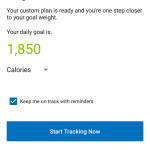 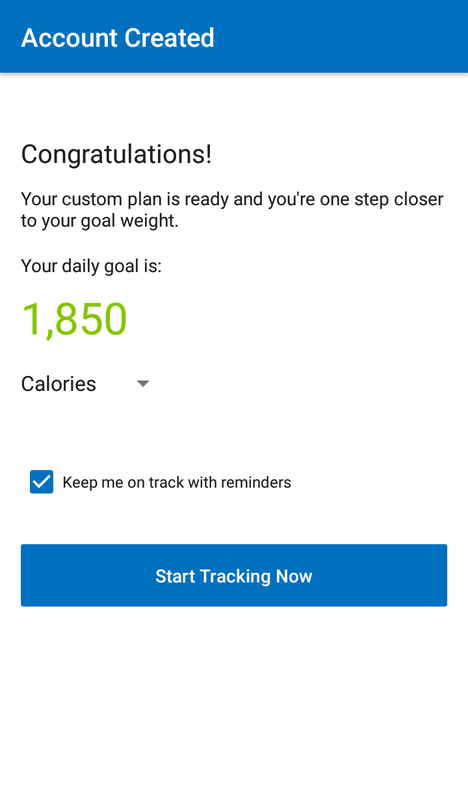 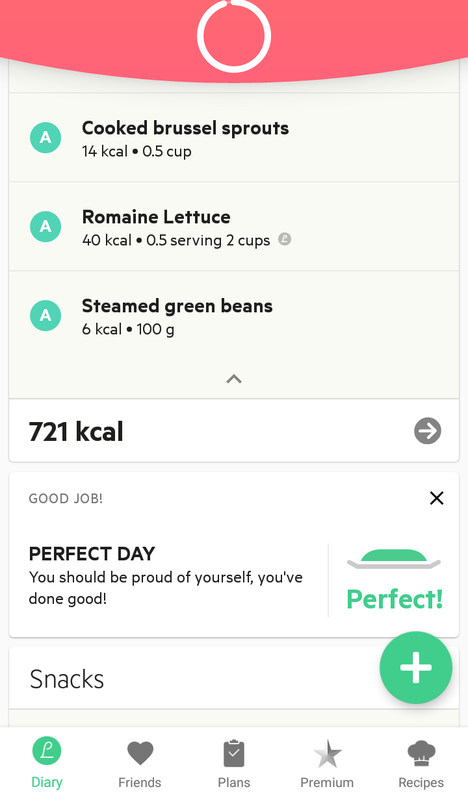 I understand their motivation to promote premium accounts, but for a calorie counter app … I really expected to be able to set the calorie goal independently. 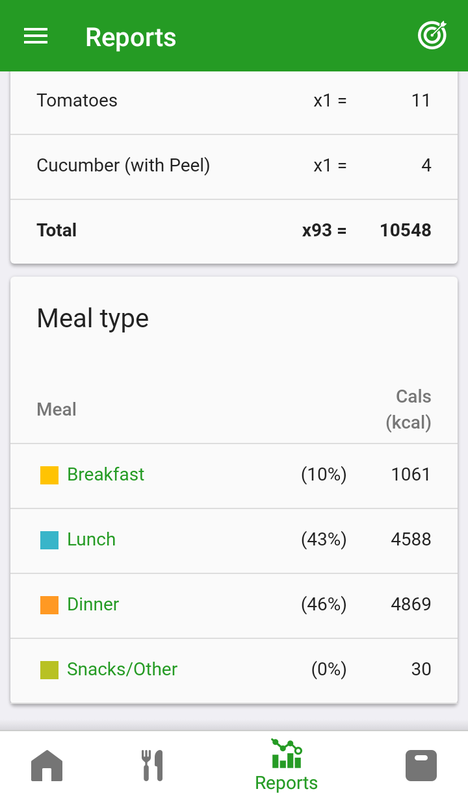 Tracking your daily intake of calories is subdivided into the usual 5 groups: breakfast, lunch, dinner, snacks, and exercise. 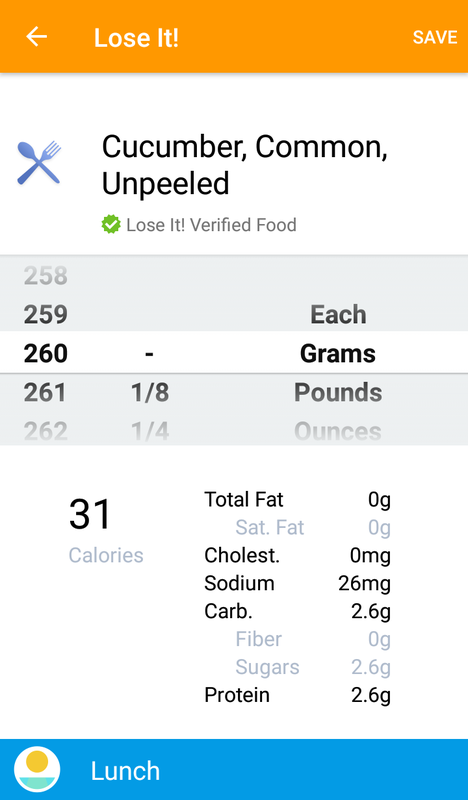 When searching for a particular food to add to your meal, Lose It! 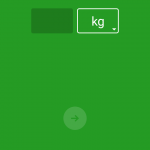 sometimes can offer an item with green badge next to its name. 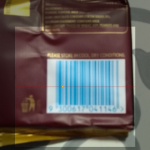 This label means that particular product or food is verified. 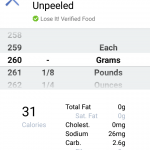 According to their documentation, it effectively means the nutritional facts have been verified and marked as accurate. 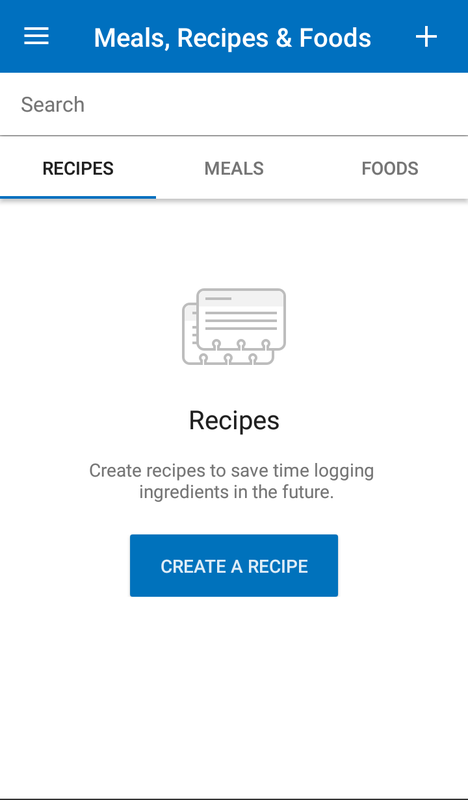 This is a feature that, as I understand, is really valuable when creating homemade recipes (where multiple slightly incorrect ingredients will create a largely incorrect recipe). 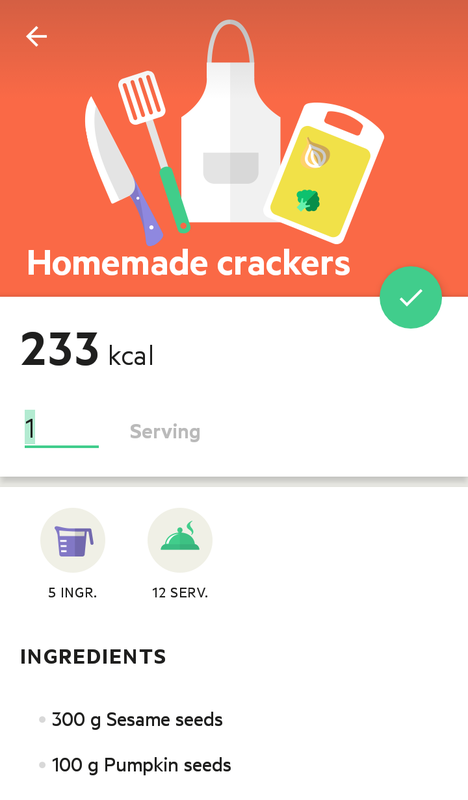 Unfortunately, the user interface (UI) is not as polished as seen on the other apps, with a few usability issues here and there. 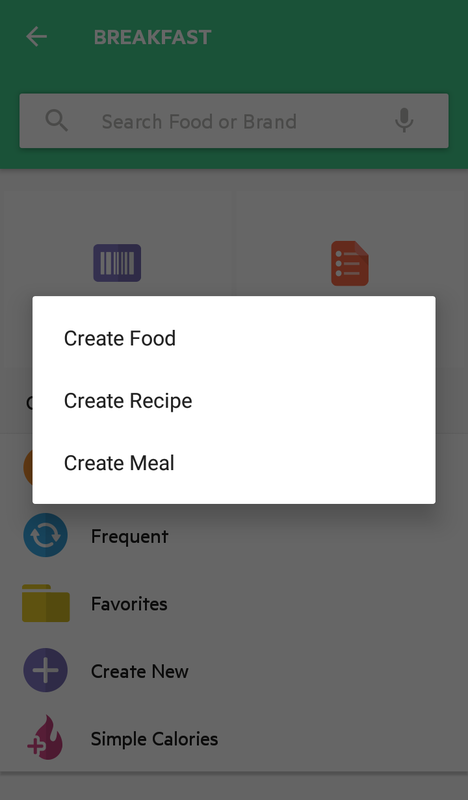 For example, in order to be able to add multiple items at once to a single meal, you have to go the overall Settings and enable this option. 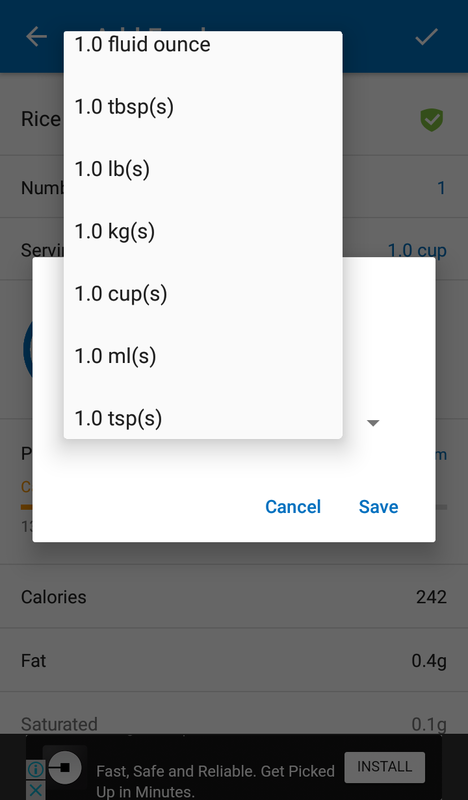 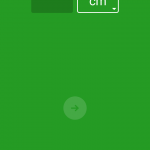 On the same UI topic, the app uses a somewhat questionable choice on the control where you can specify the serving size or quantity of a certain ingredient: a scrollable picker. 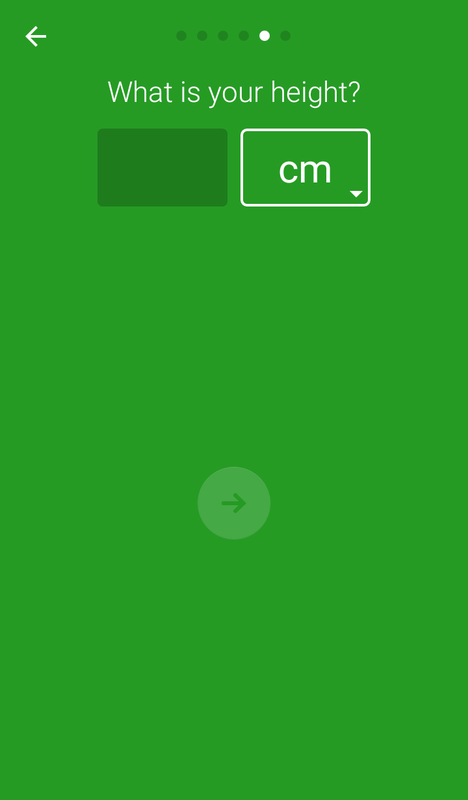 It is possible to scroll the fractions part in order to reach the number you want faster, but I’d argue to say it is easier to simply type the numbers in. 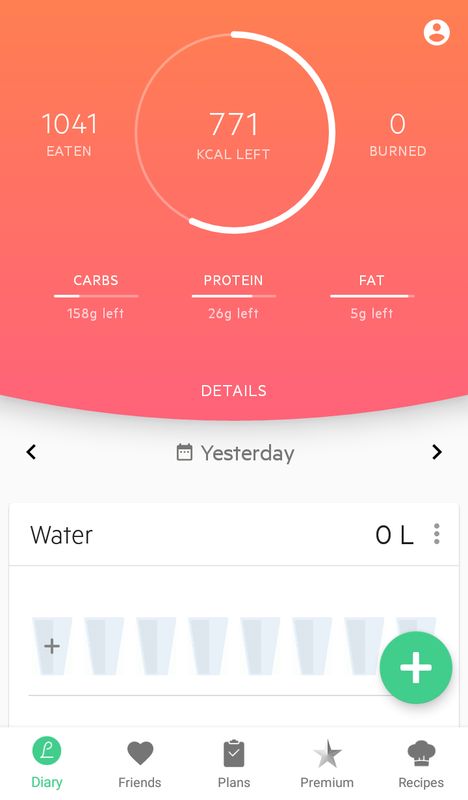 Finally, a dedicated water intake tracker is only for premium accounts. 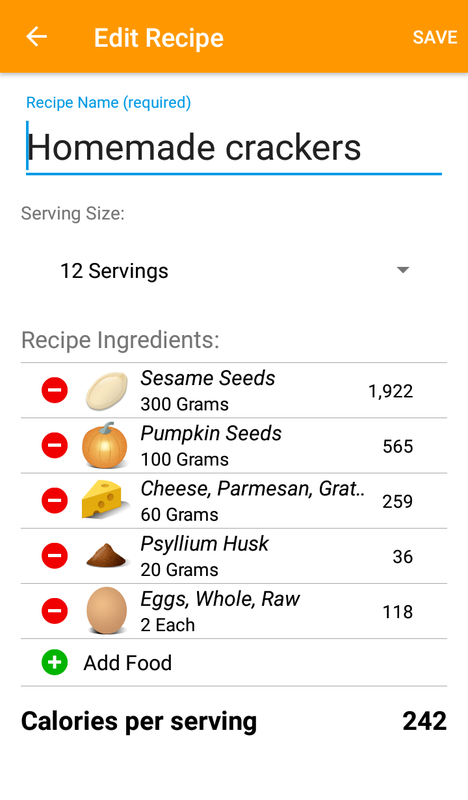 Putting aside the quantity/serving size picker issue described above, the app offers a very efficient flow to create homemade recipes. 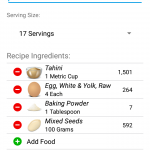 The required information is exactly what you would expect to provide: a name for your recipes, number of servings, and a list of ingredients and their respective quantities. 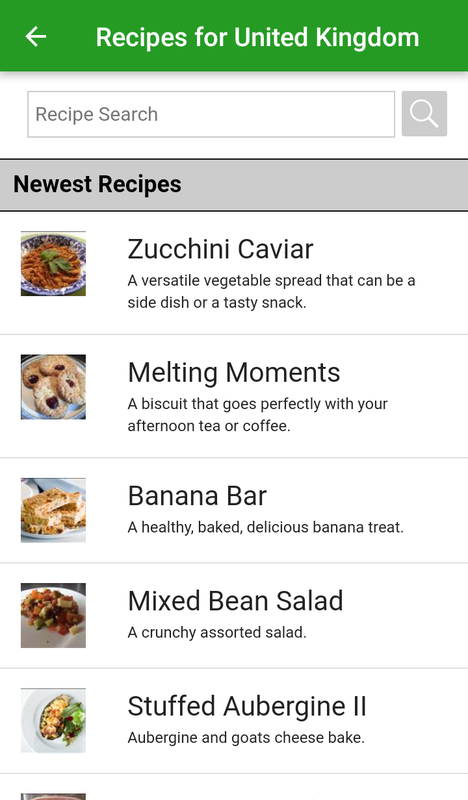 Even without a premium account you can create as many recipes as you want. 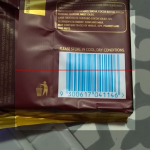 Adding standardised products by scanning barcodes is also responsive and worked well for the products I tested during this period. 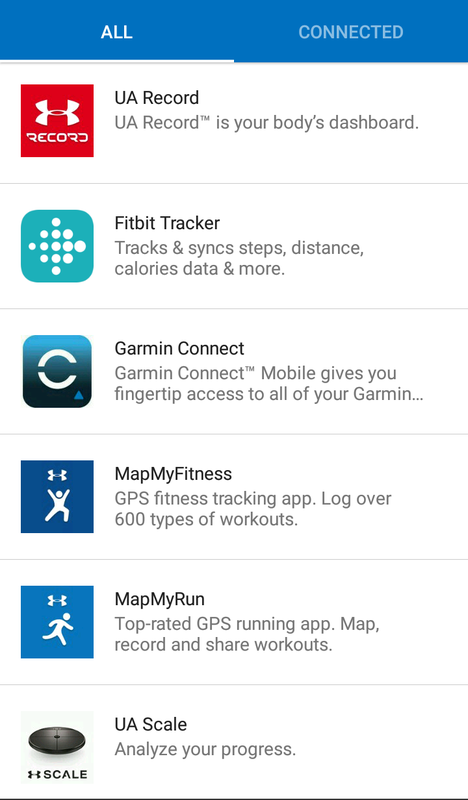 Despite not being apparent or mentioned in the app’s own Settings, Lose It! 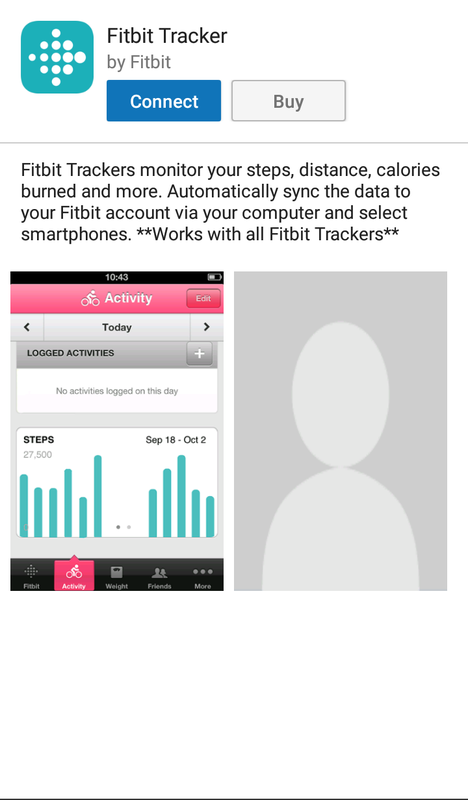 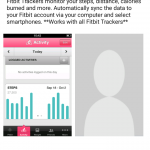 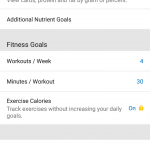 integrates with fitness apps and devices in order to track your exercises. 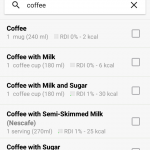 And I must say I had to do a bit of research online in order to discover the feature really existed and worked, so once again another usability issue. 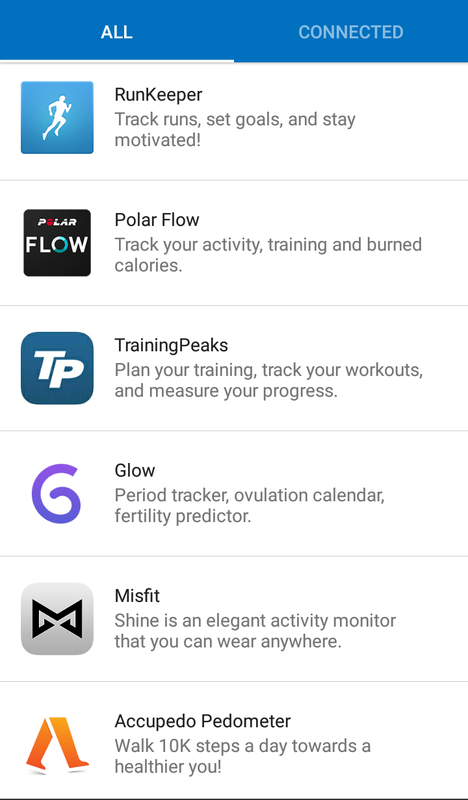 The app supports, directly or indirectly, the following apps or devices: Google Fit, Apple Health, Nike+ Run Club, Runkeeper, Strava, and MapMyFitness. 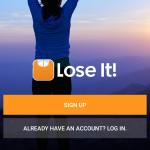 Lose It! 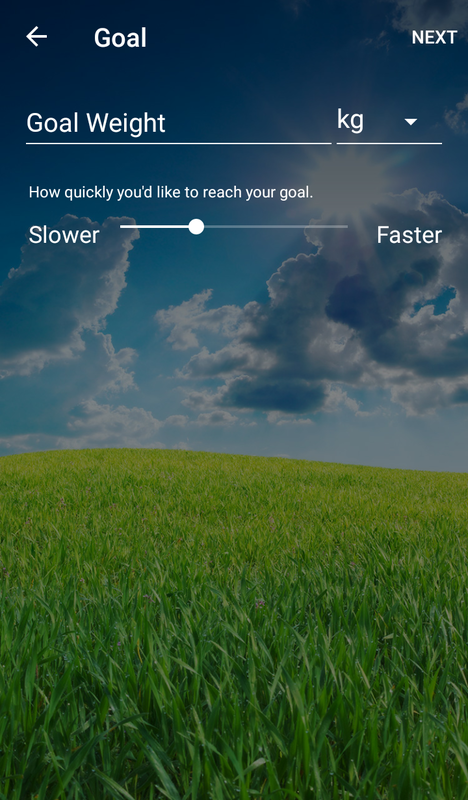 offers a multitude of notification preferences, but for the purpose of keeping you focused on your goal, “encouragement to keep you going” is pretty much the only option relevant. 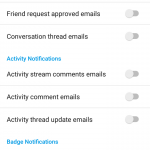 There are heaps of other notifications a bit more focused on the social side of the app such as friend requests, comments, badges, shares, groups, and challenges. 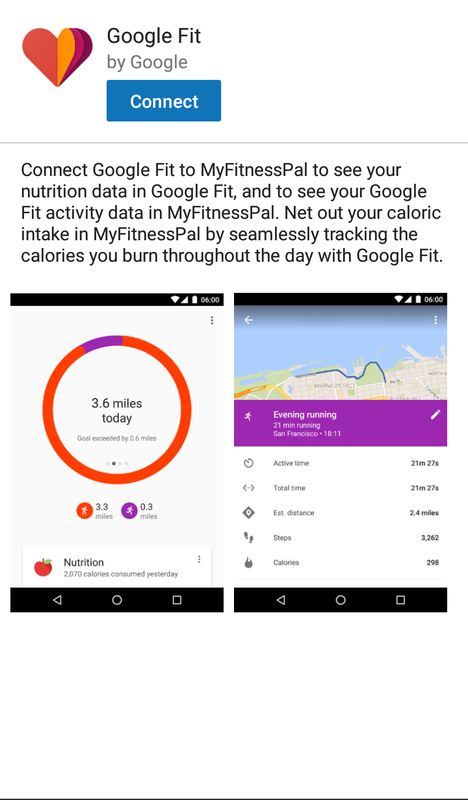 The idea of connecting to friends is, in my opinion, especially useful when you are trying to do calorie counting with your significant other, for example. 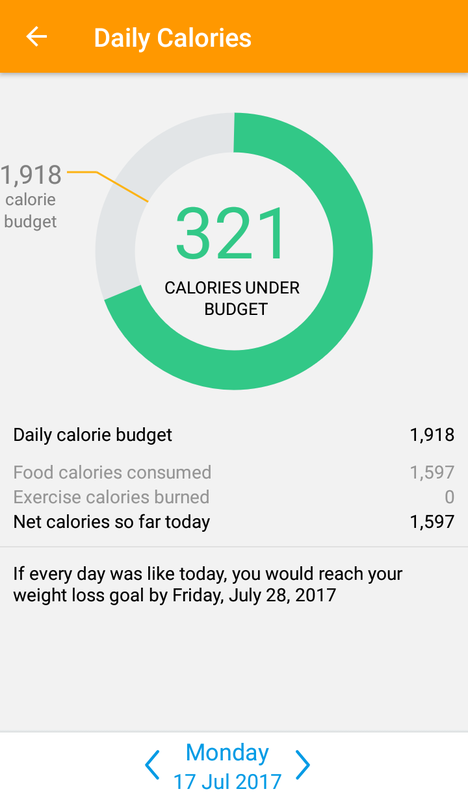 After all, one can help the other to stay motivated, and in the end, both parts win. 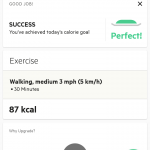 The daily reports given by Lose It! 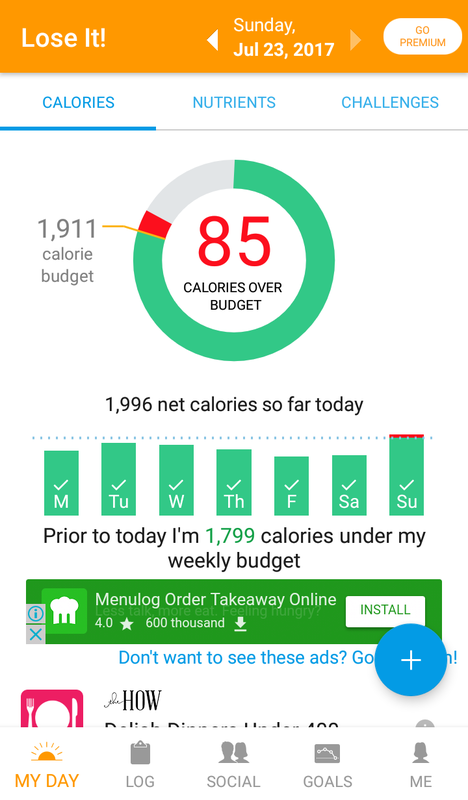 is quite minimalist and pretty much summarises, in a single line, your day according to the calorie budget calculated initially. 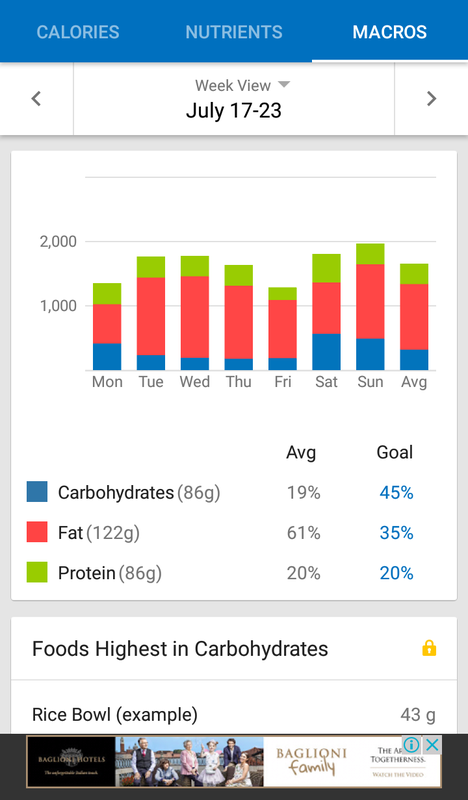 Then, by switching to the “My day” tab, you will be able to access a combined daily and weekly view of your progress. 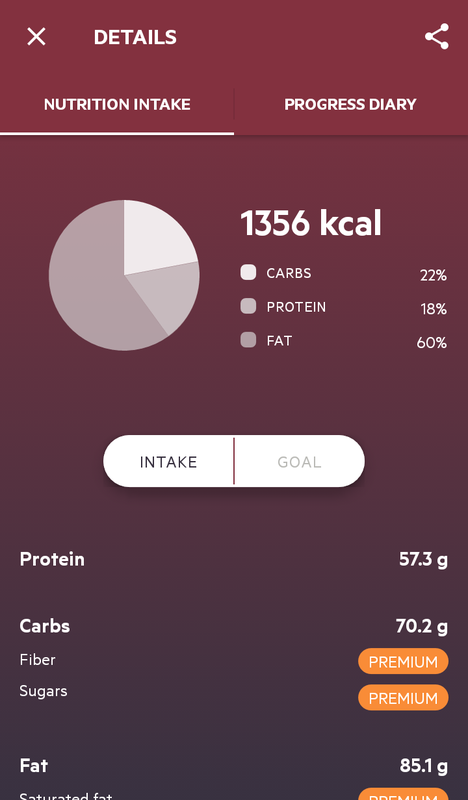 Macronutrients (fat, protein, and carbs) are displayed in an easy-to-understand pie chart, and by tapping it you are taken to an additional view where you can explore how this particular compares to the rest of the week. 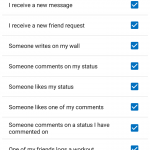 As a side note, I found the user interface in this particular section of the app a bit unpolished. 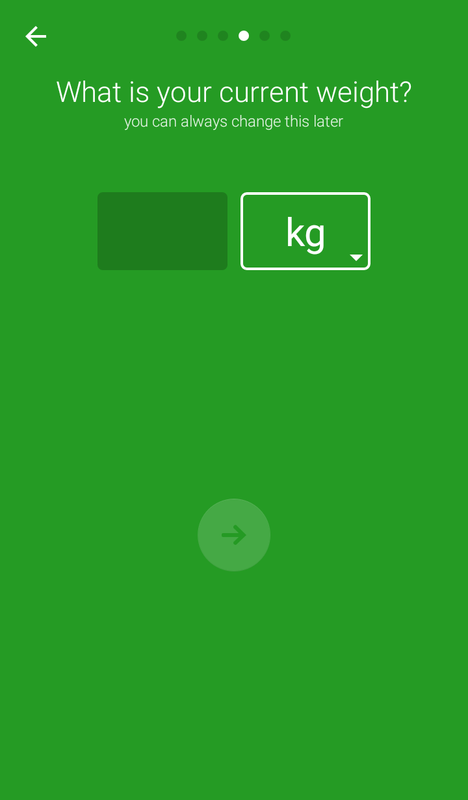 It is not hard to find elements that are displayed in a tiny space and needlessly over multiple lines, such as the label “Fat”, when there was plenty of space around the element. 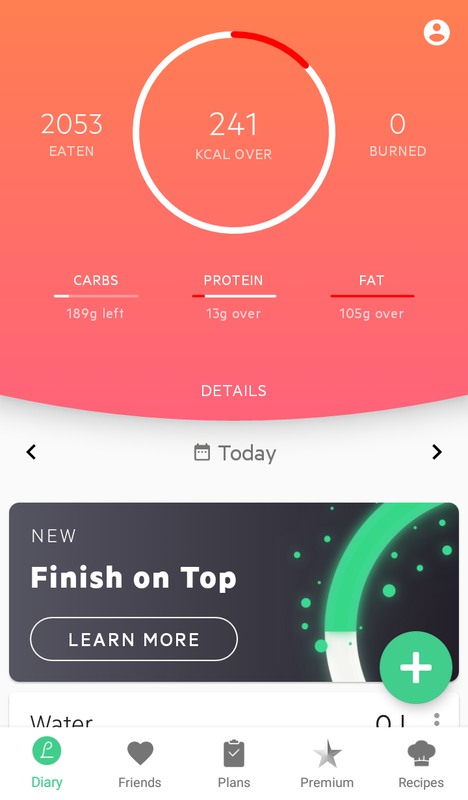 The app also features a tab called “Challenges”, where I assume you would be able to join a community and earn points as you log what you eat. 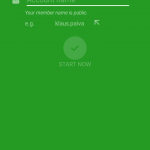 However, you can only join challenges by upgrading your account to premium. 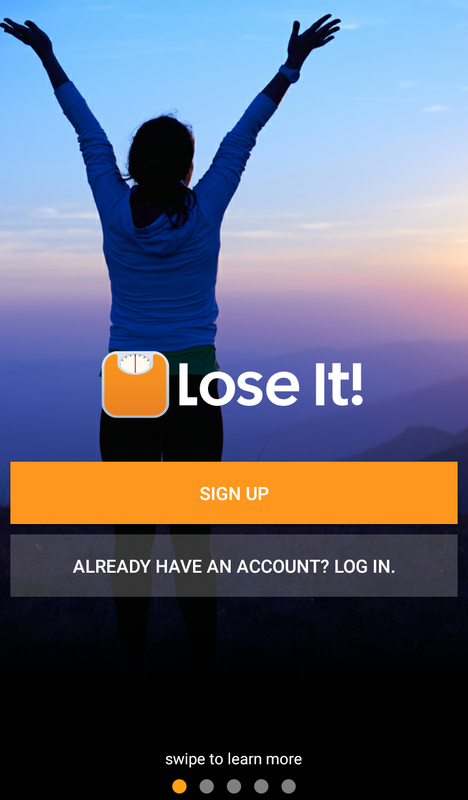 Lose It! 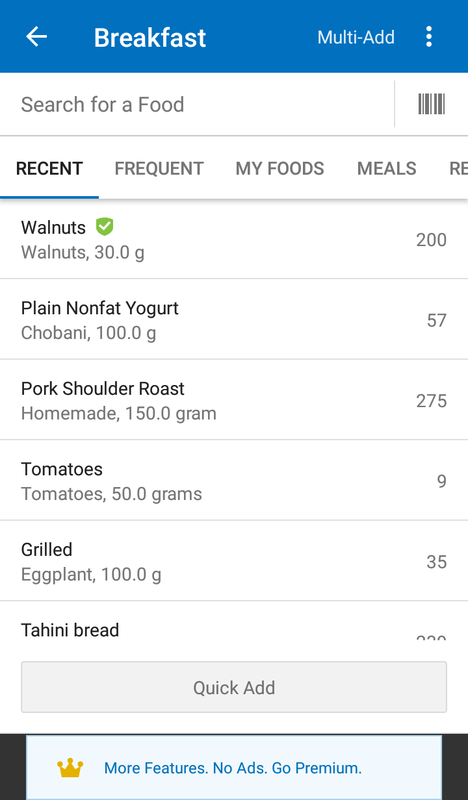 scored extra points in my ranking by having “verified foods“. 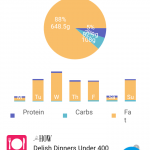 As I said above, this is nice to ensure the numbers you are getting actually reflect more closely what you are eating. 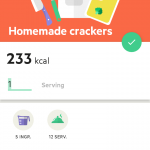 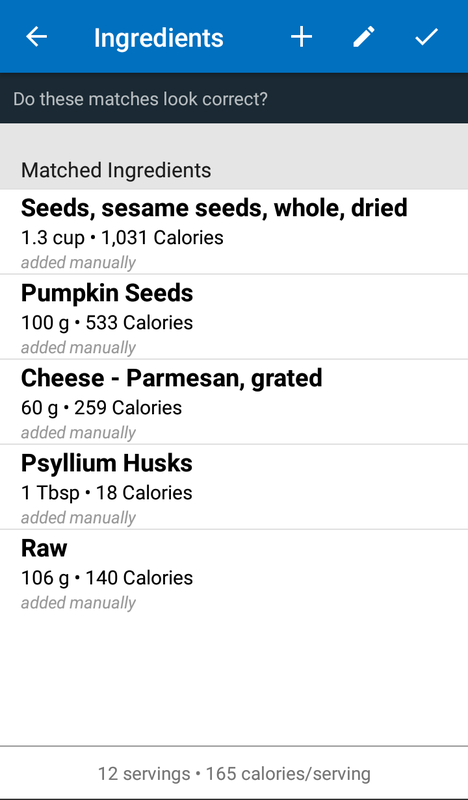 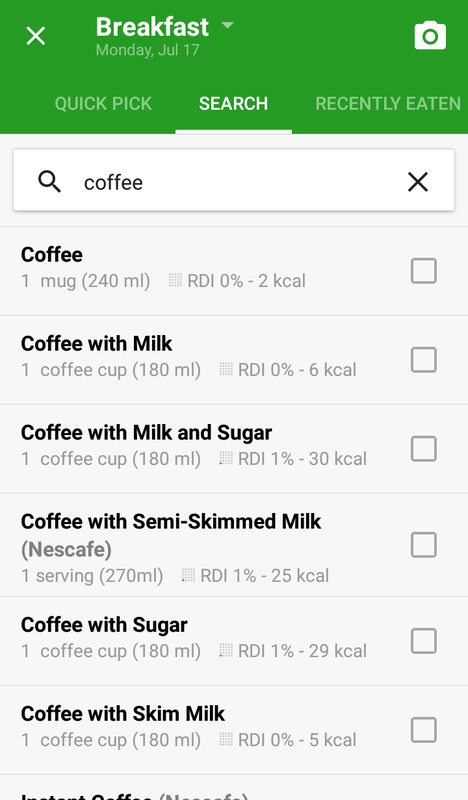 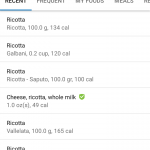 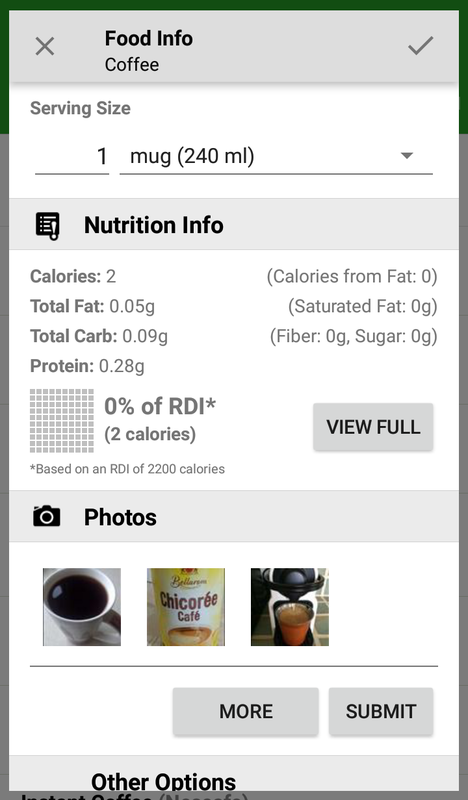 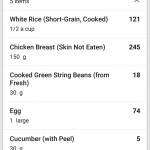 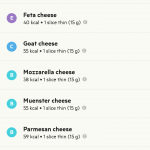 As a freemium calorie counter app, I found positively surprising the fact that you can add as many homemade recipes as you want. 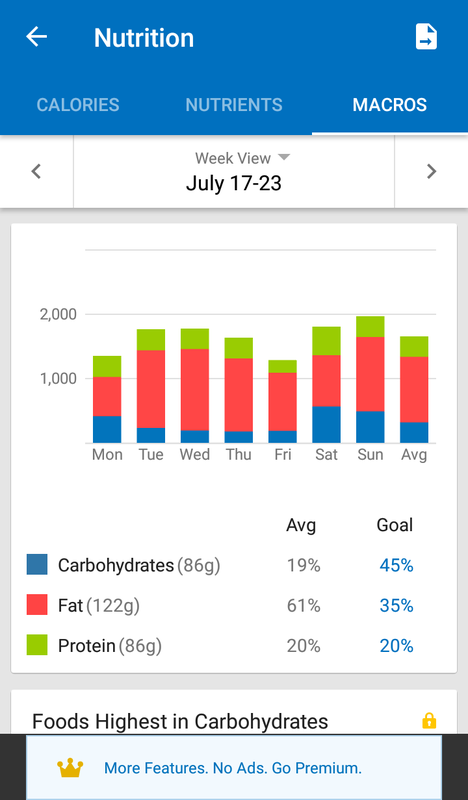 My main remarks, however, are related to the overall usability of the app: reports and chart seem a bit unpolished, with labels spanning across multiple lines when there is plenty of space around; the unusual scrollable picker I described above, and the option to add multiple items at once that is a bit hidden in the app settings. 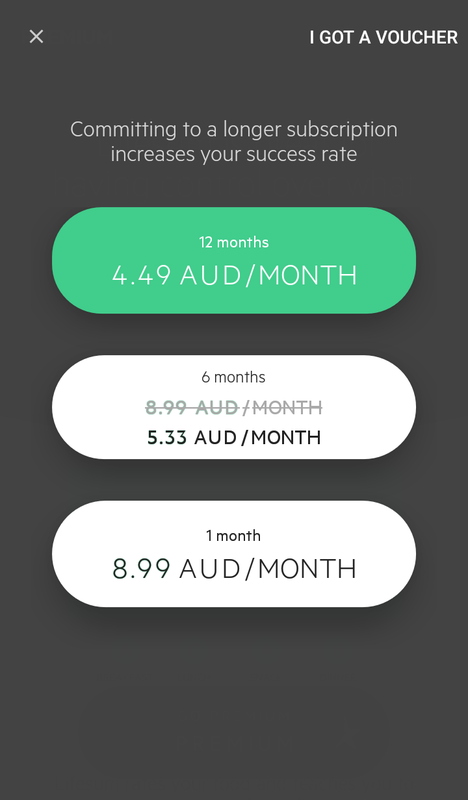 Nonetheless, being a freemium app that is perfectly functional for users not willing to pay is definitely a plus. 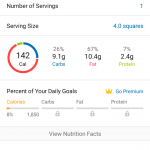 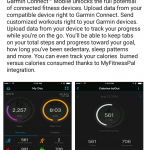 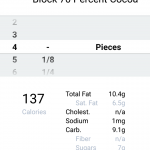 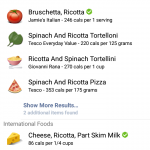 MyFitnessPal is another popular choice of calorie counter app. 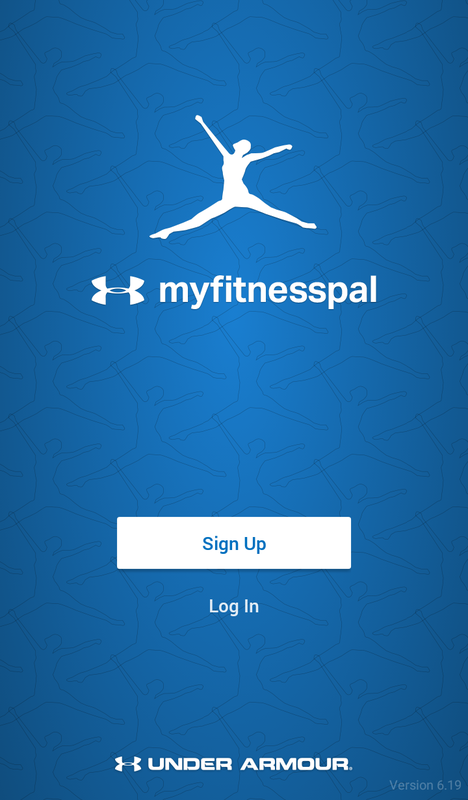 It was acquired by the Under Armour group in 2015. 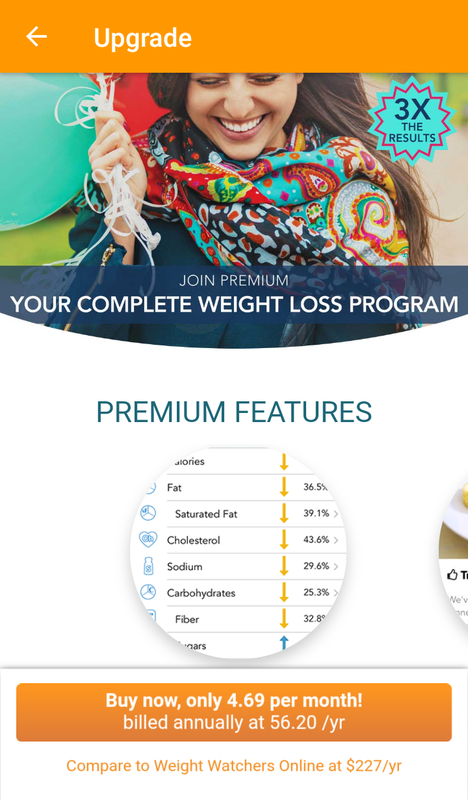 It offers a subset of functionalities exclusive to premium subscribers, but in this review only features available to all users (free) were considered. As soon as you open the app, you will be presented with the usual onboarding experience. 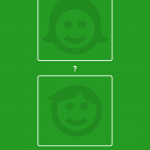 The flow consists of 5 simple screens that are briefly explained in the next paragraphs. 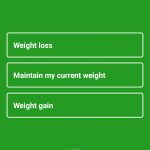 Start by defining your overall goal, where the options are: lose weight, maintain weight, or gain weight. 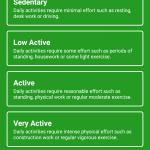 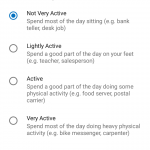 Next, the app asks for a self-assessment of how active you believe you are, from “Not very active” to “Very active“. 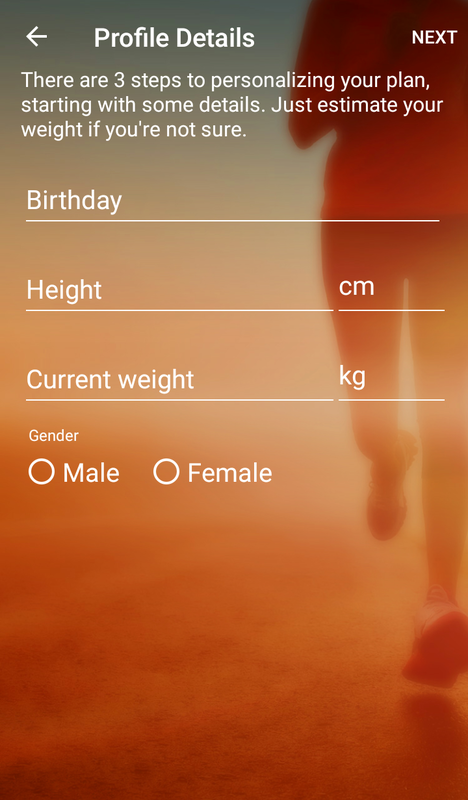 The fourth screen has fields to input your height and current weight. 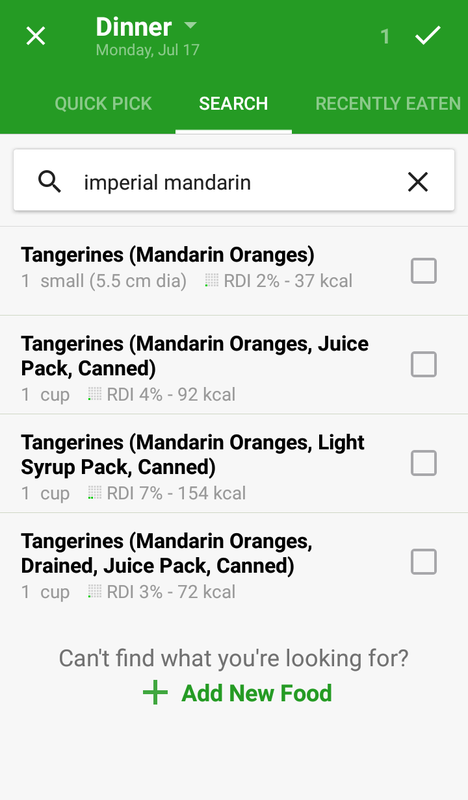 Despite setting my location to Australia, the app still showed by default units in the imperial system (but you can change to metric). 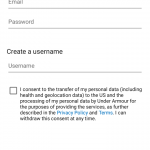 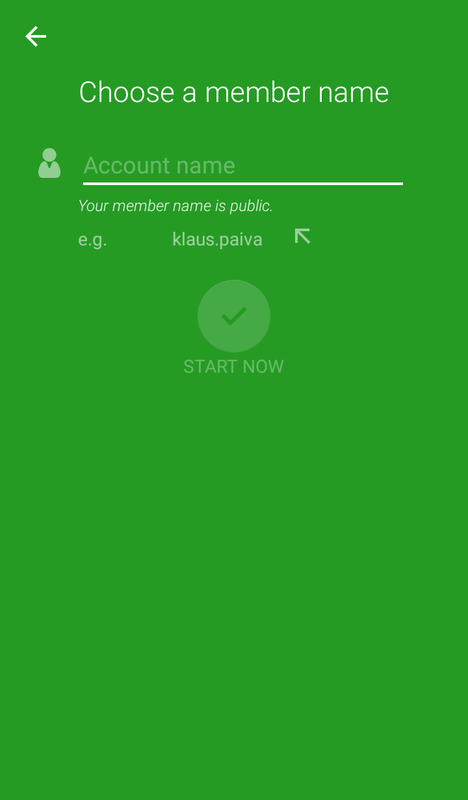 You then finally will complete the flow by creating an account by providing a username, email, and password. 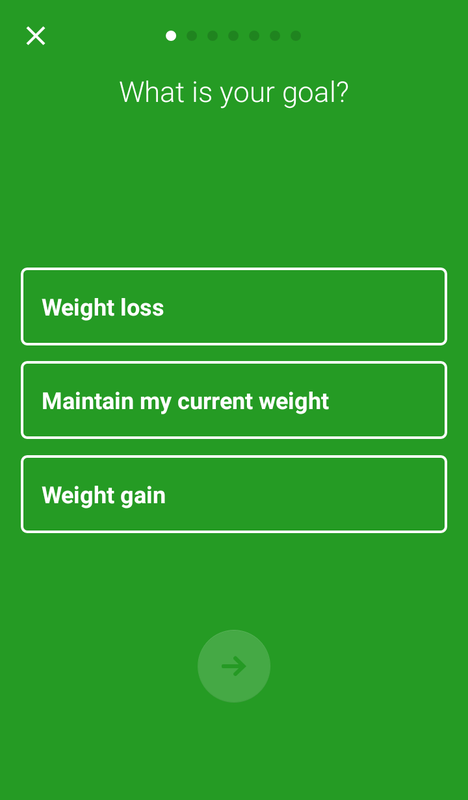 This is the topic where the app really shines. 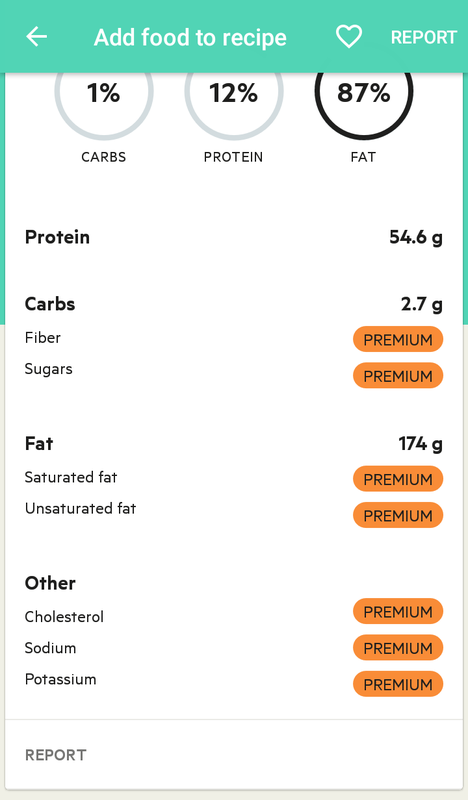 Even without a premium subscription there are heaps you can customise in terms of app behaviour and nutrition settings. 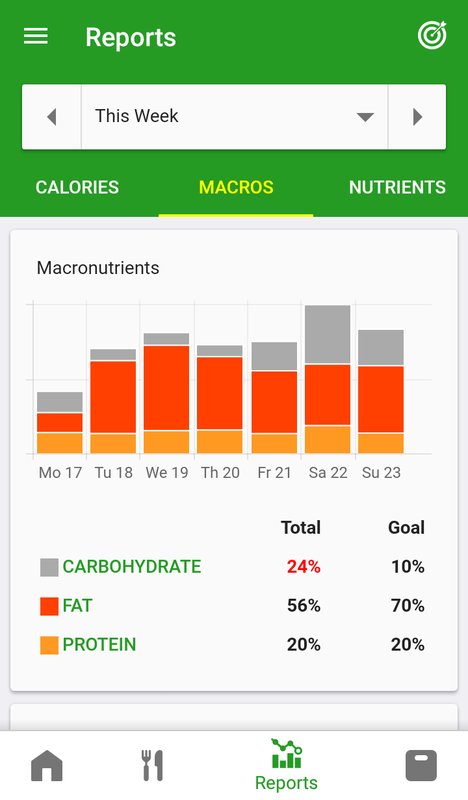 For more refined daily and weekly goals, you can not only set your calorie budget but also specify a distribution of macronutrients you are planning to meet as you log entries. 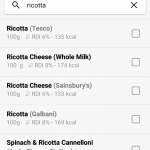 If you are really into managing every single aspect of your diet, you can go very specific and also set how much saturated fat, sodium, fibre, sugars, vitamins … just to name a few of the options. 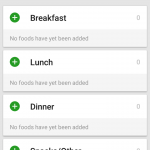 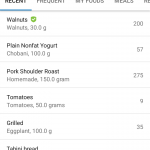 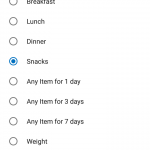 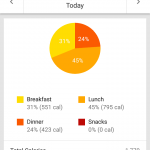 When logging your daily consumption, the app gives you the 4 usual grouping options: breakfast, lunch, dinner, and snacks. 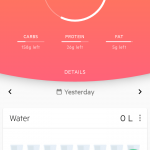 There is also a dedicated section where you can track water intake; useful to ensure you are keeping your body properly hydrated throughout your day. 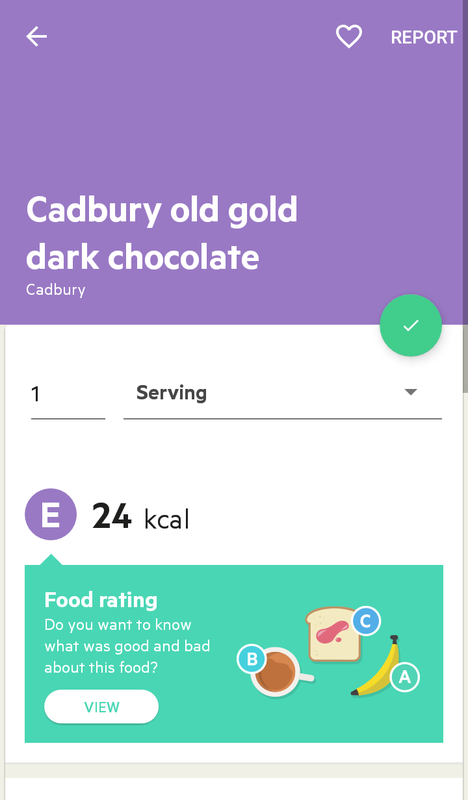 Another very handy feature that you can notice as you log things is the green “check mark ✅” to indicate verified products; as you know, some foods can be submitted by other users, so they may have incomplete or perhaps inaccurate nutrition facts. 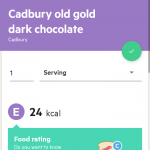 A verified food mark shows you that the nutrition information for that particular has been reviewed and labelled as correct. 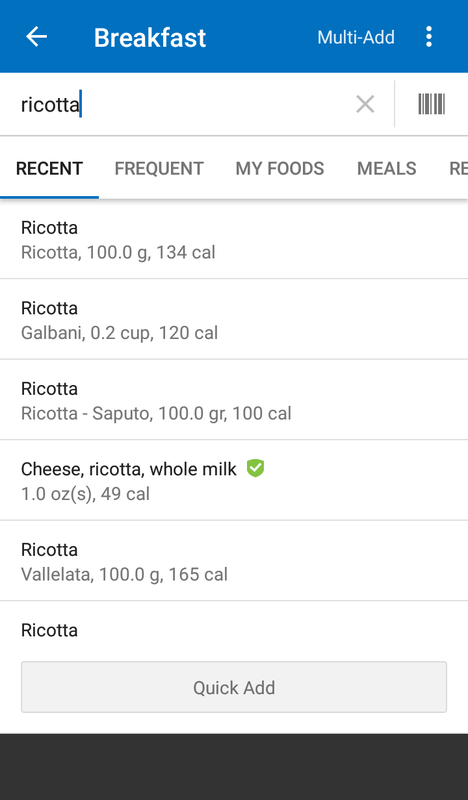 In terms of usability and user information, the app does a nice job with the option to add multiple foods clearly visible when selecting any of the meal times. 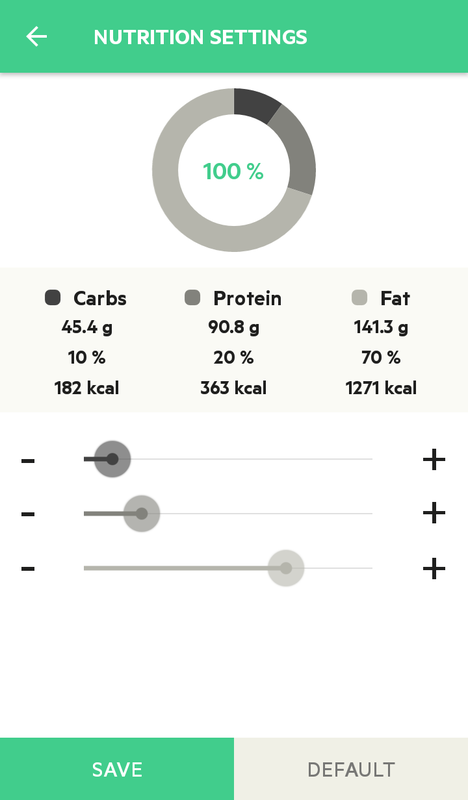 It is also cool that when a food has a certain characteristic, such as meat being generally a good source of protein, the app displays an informative sentence once you add to your meal. 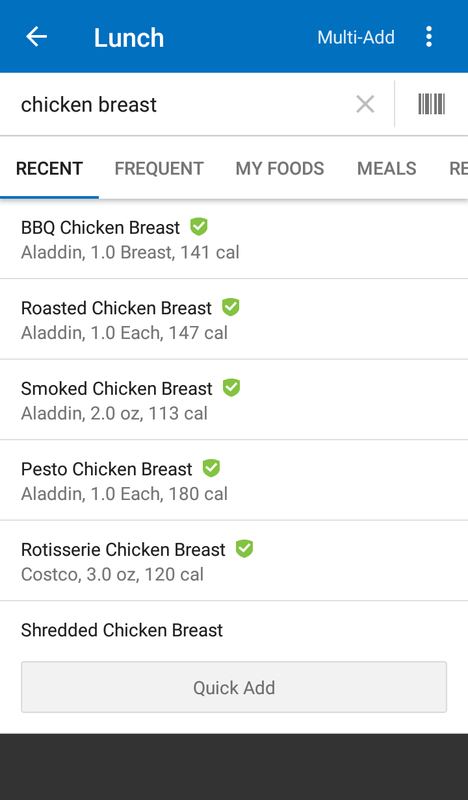 Using the same interface and food selection flow as when you do daily tracking, creating a homemade recipe is very easy with MyFitnessPal. 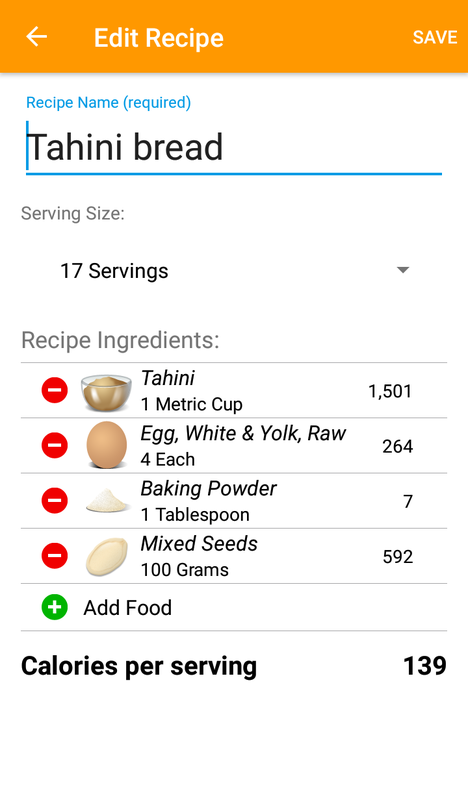 In order to create your recipe you basically need to provide: a name (so you can find it later), the total number of servings, and a list of ingredients with their respective quantities. 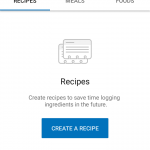 As a free user you can create as many recipes as you want, which is great! 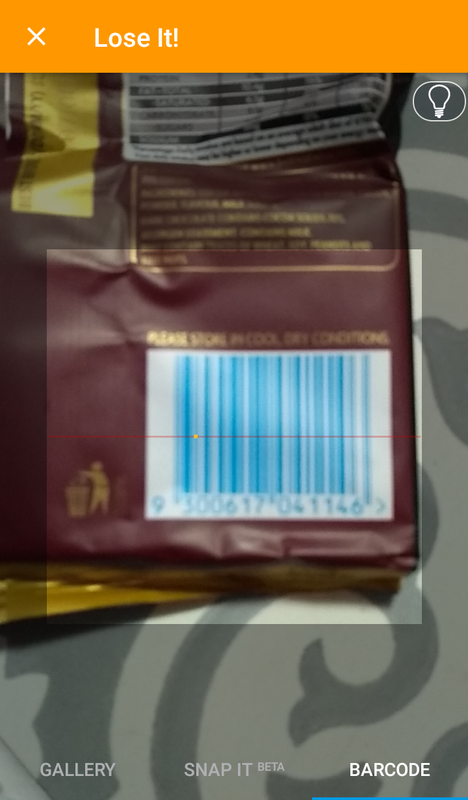 Finally, scanning barcodes to quickly add standardised products worked quite well for the items I tested. 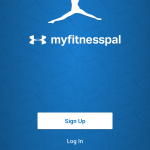 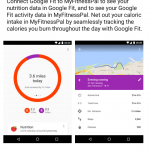 MyFitnessPal simply blows every other calorie counter app out of the water with impressive 38 integrations – that’s right, THIRTY-EIGHT – with fitness trackers (apps or devices) to automatically track your exercises. 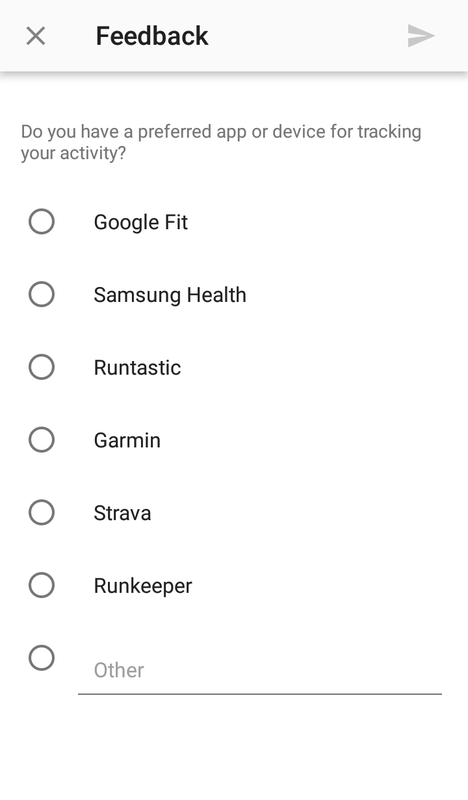 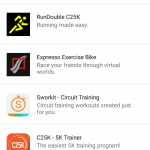 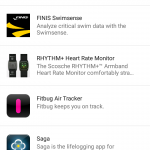 I will not even try to list all available integrations because it might already be out-of-date by the time I finish, but just to name some of the most popular ones: Fitbit, Garmin Connect, Endomondo, Withings, Strava, Runtastic, Runkeeper, Google Fit, and Apple Health. Although not enabled by default, you can easily add personalised notifications (called Reminders in the app settings) to send you a message in case you have not logged a meal after a certain time. 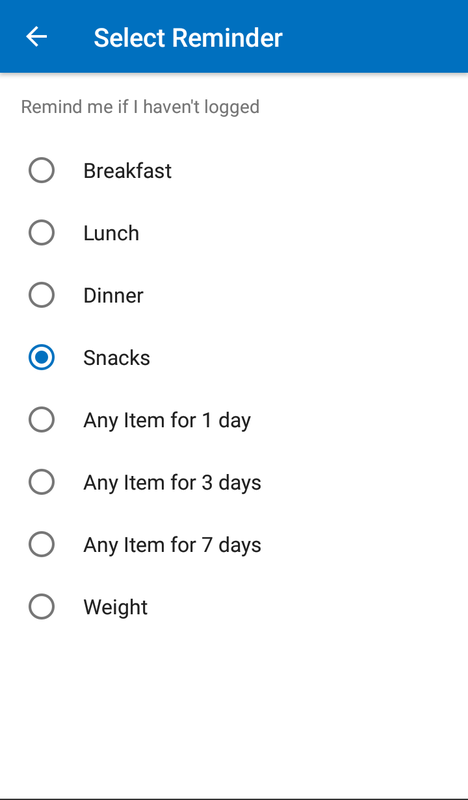 I particularly feel it should be enabled by default until you either get used to the routine of logging your meals or simply decide you no longer need them. 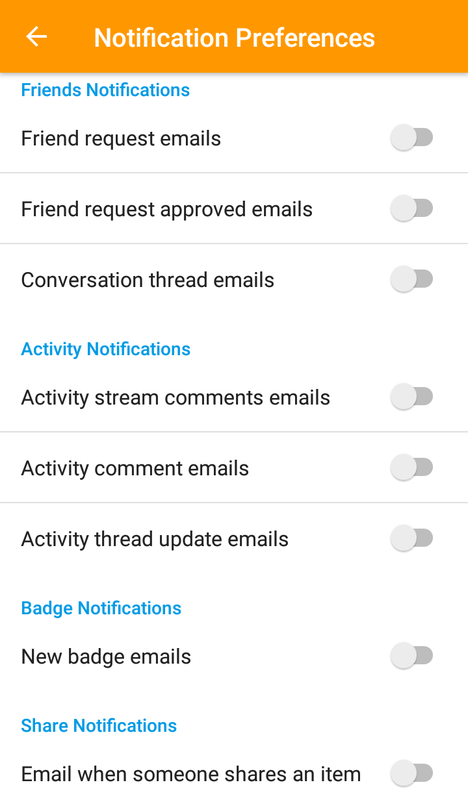 The app also has a section dedicated to push notifications, but in this case, it actually means the social features of the app, such as receiving a friend request, a comment on your status, somebody writing to your wall, etc. 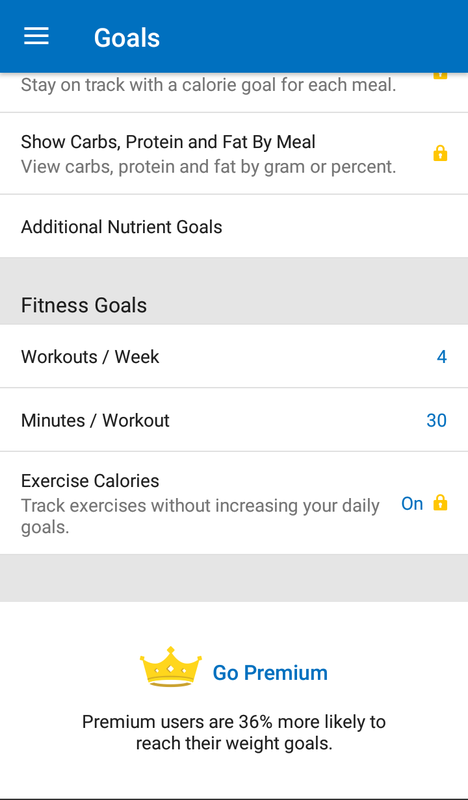 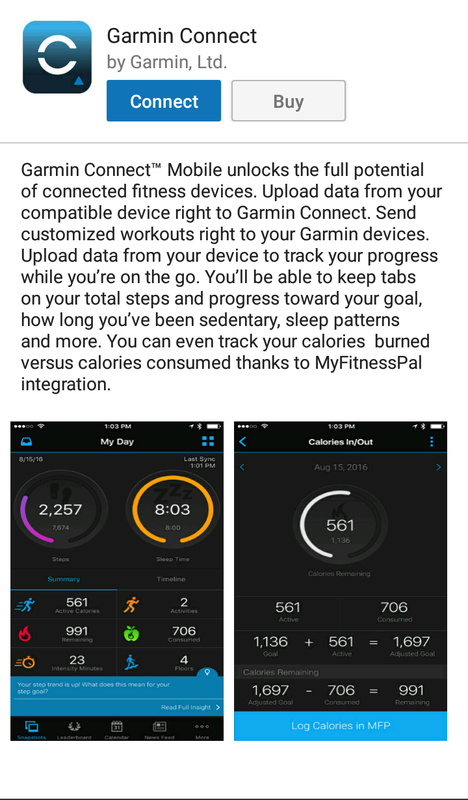 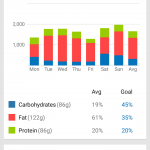 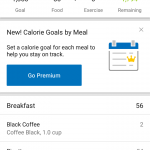 MyFitnessPal offers two main perspectives over the information you add; daily and weekly. 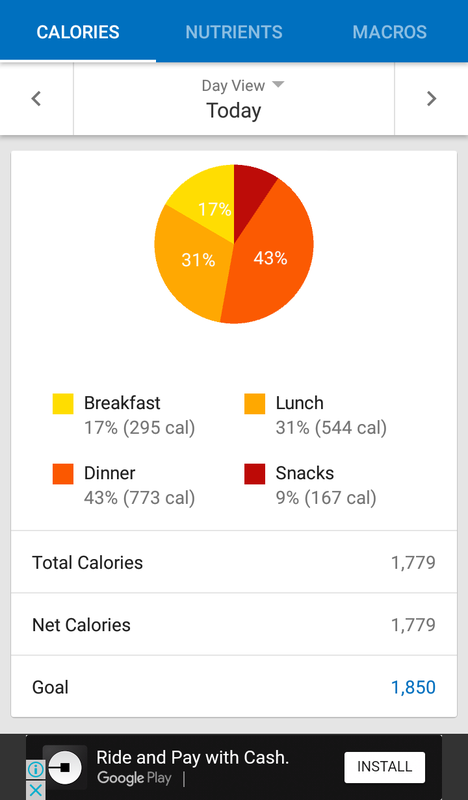 On the daily view, there is a pie chart displaying how much each of the main meals (breakfast, lunch, dinner, and snacks) contributed to your daily calorie intake. 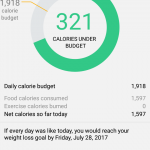 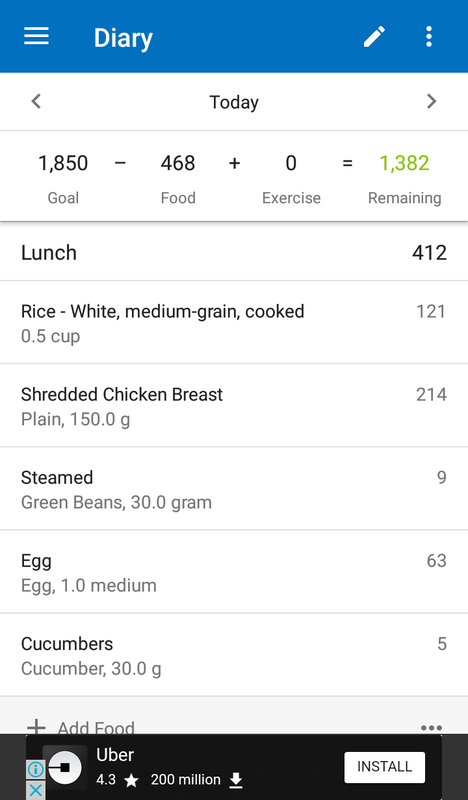 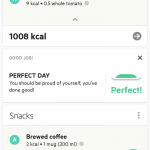 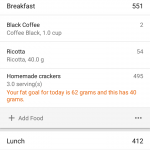 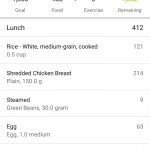 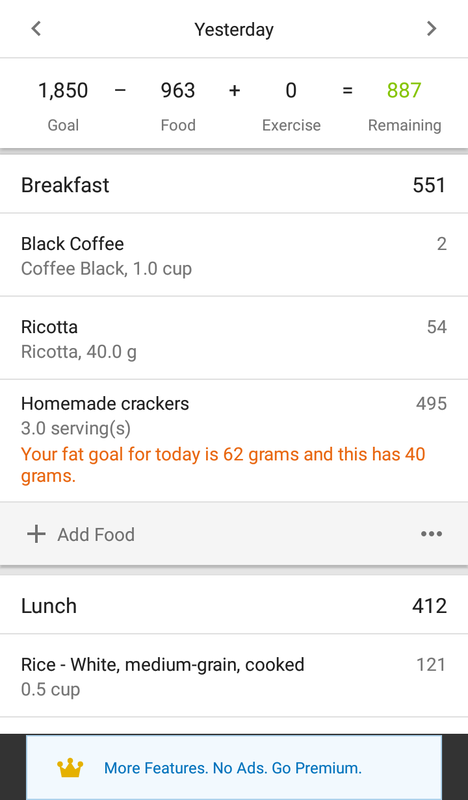 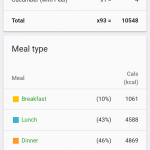 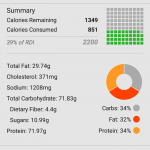 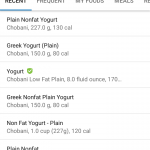 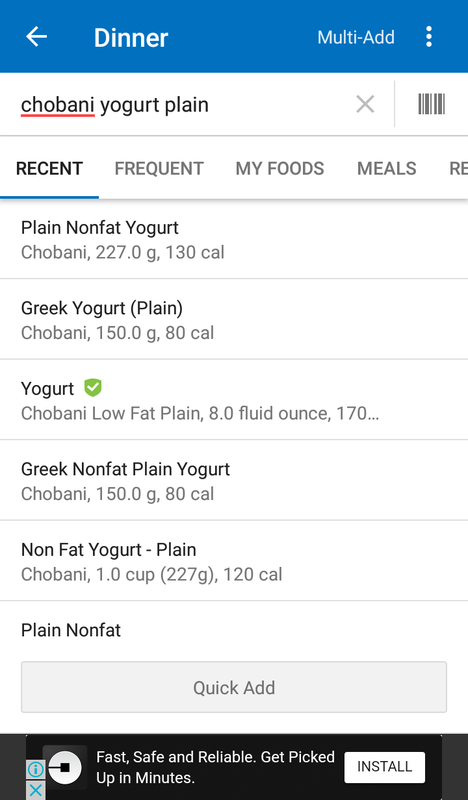 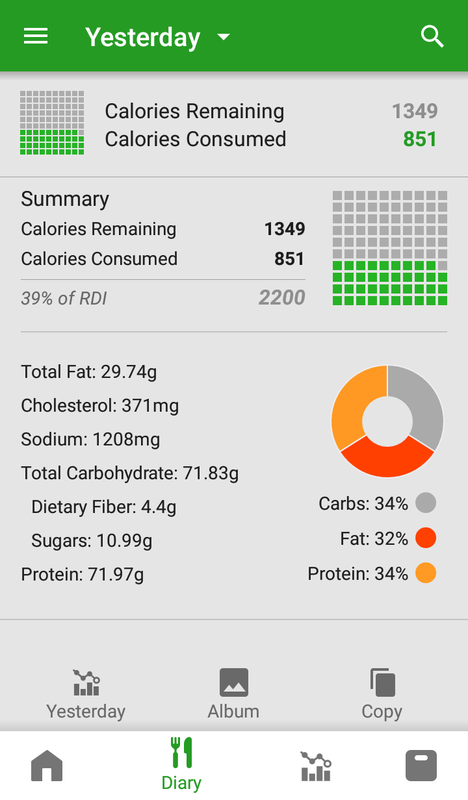 For premium users, the app also seems to be able to give a summary of the most caloric foods consumed on that particular day. 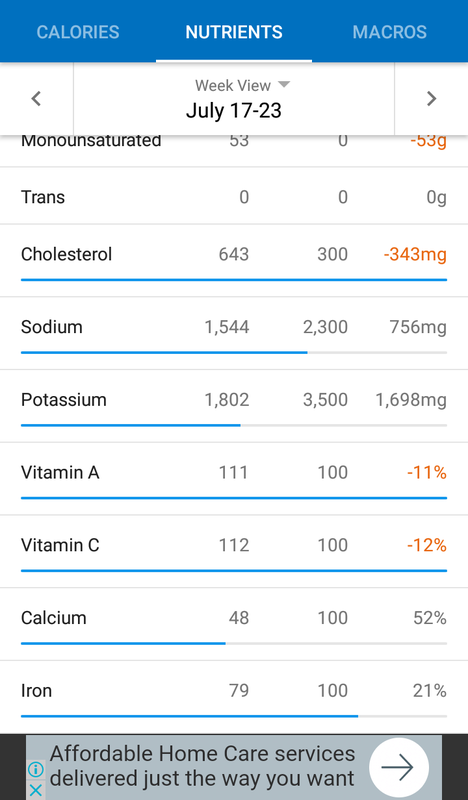 A second tab of the daily view (labelled Nutrients) display a complete table of nutrients, according to the quantities logged by you throughout the day. 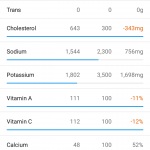 Useful in case you need to monitor your intake of a particular nutrient, let’s say like fibre or calcium, for example. 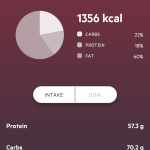 Finally, the third tab aggregates data to display, also as a pie chart, your day according to three groups of macronutrients: carbs, fat, and protein. You can also see percentages and easily compare with your goals, in case you are following a diet where you need to track these values. 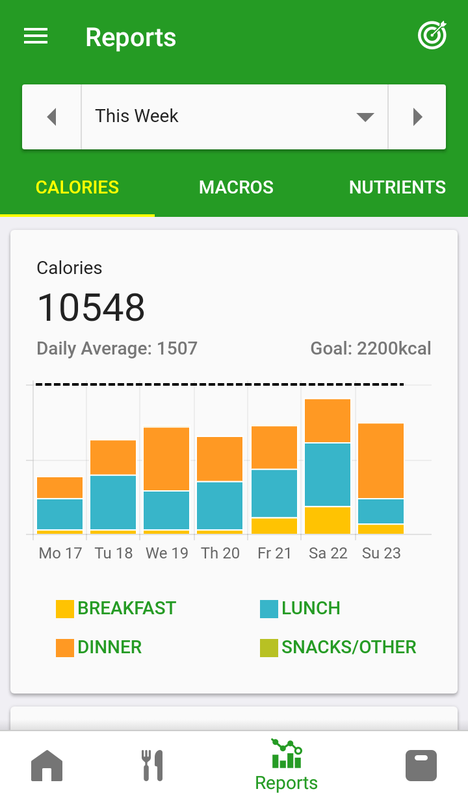 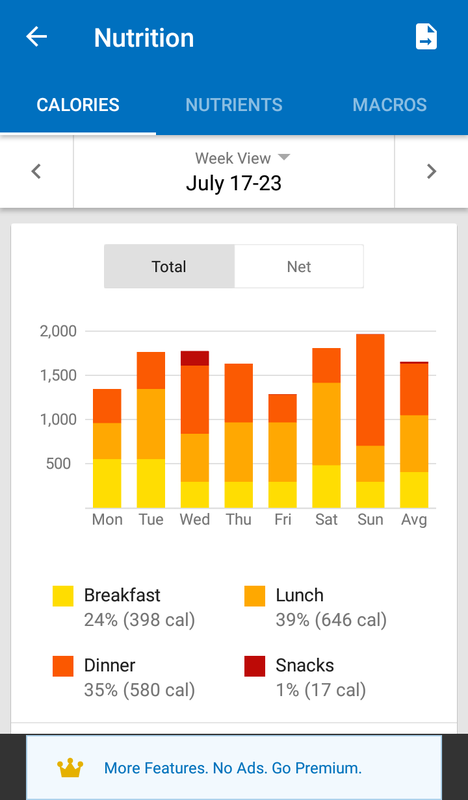 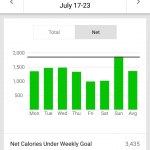 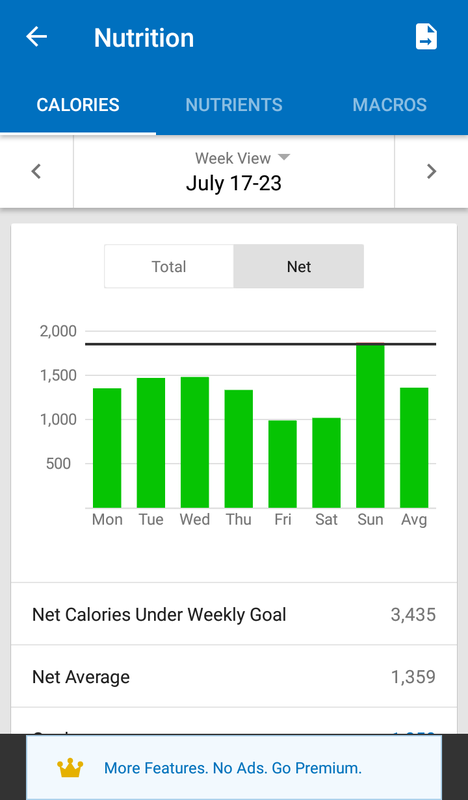 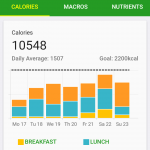 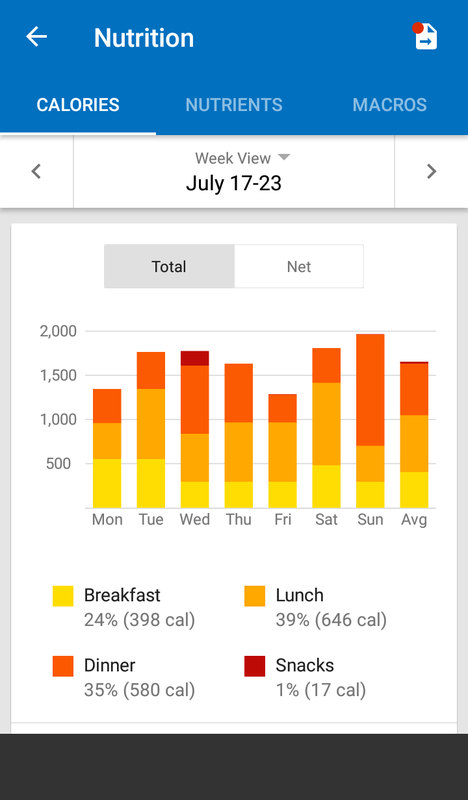 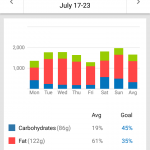 Once you have completed at least one week of calorie tracking, the weekly view becomes useful to get an overview of how well you performed. 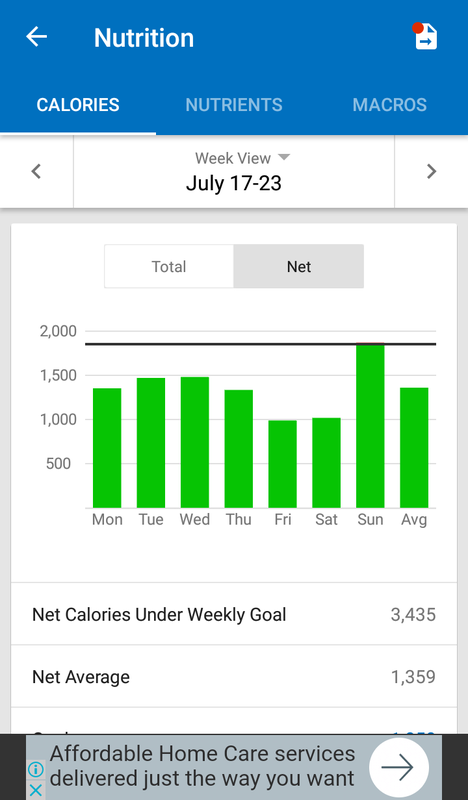 The data displayed is pretty much the same as the daily view, except that in this case it is aggregated as a column chart, so you can easily compare different days. 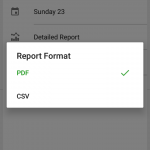 The option to export reports, however, is only available for premium users. 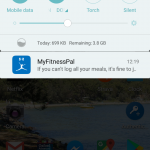 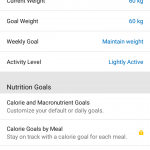 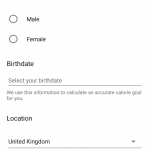 MyFitnessPal is the undisputed champion when the subject is customisation. 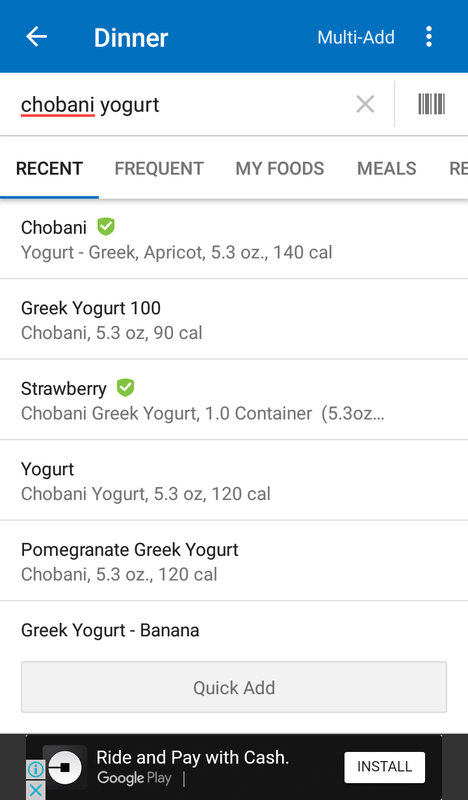 The app is well-organised and the user interface is polished, making it easy to navigate through the menu screens even though the number of options available is huge. 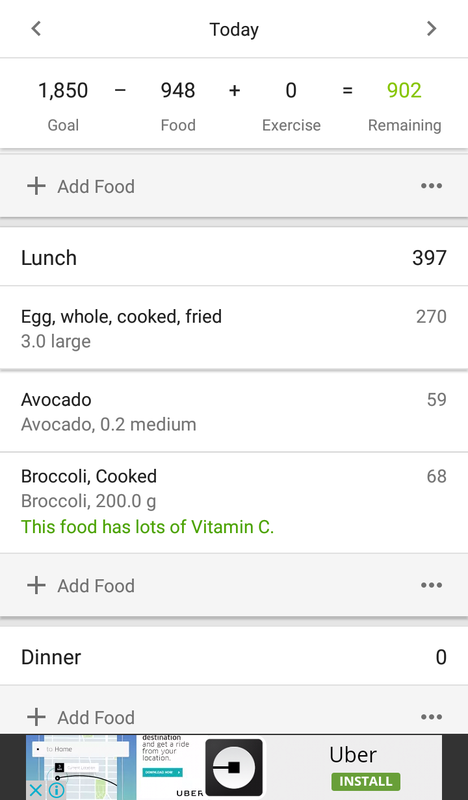 Logging your meals is also very logical, and having verified foods is a nice addition to boost your confidence of the results reported. 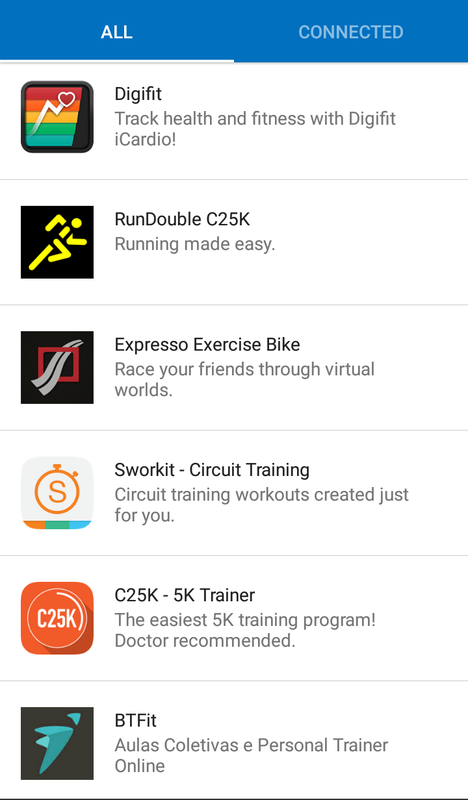 The enormous number of integrations with fitness apps or devices is also second to none, which is a great plus to simplify and reduce repetitive work. 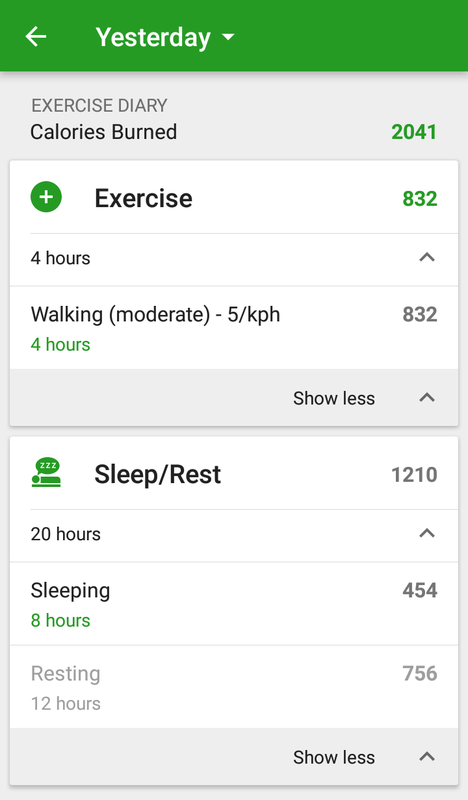 On where the app could do a bit better, I can say the reports are a bit simplistic. 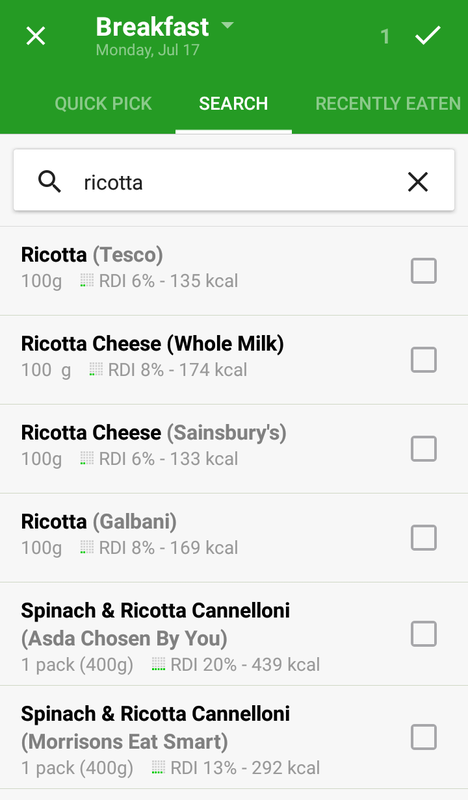 Based on how much you can customise other parts of the app, I had higher expectations on how I would be able to visualise my diary. 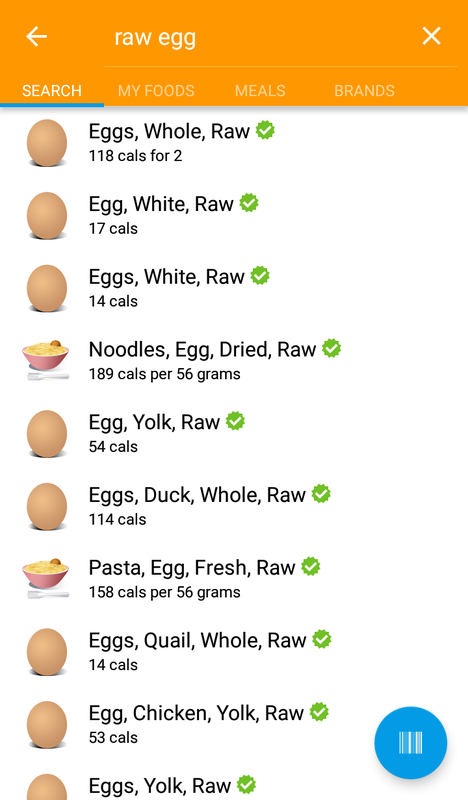 The table below summarises everything I have reviewed and discovered during the test period, so you can easily make your decision about the best calorie counter app in less than 5 minutes! 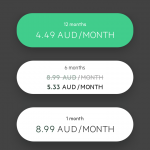 If you think I missed something during my analysis, or maybe missed your favourite app entirely, please make sure to leave a comment below to join the discussion.